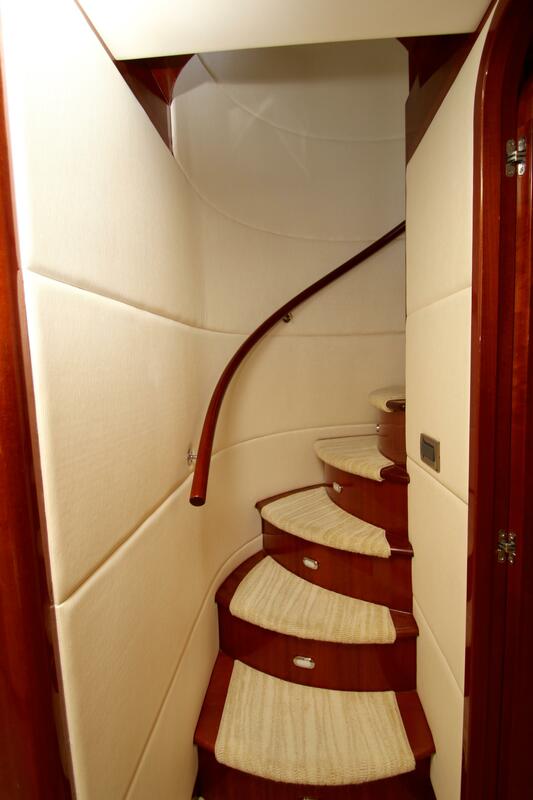 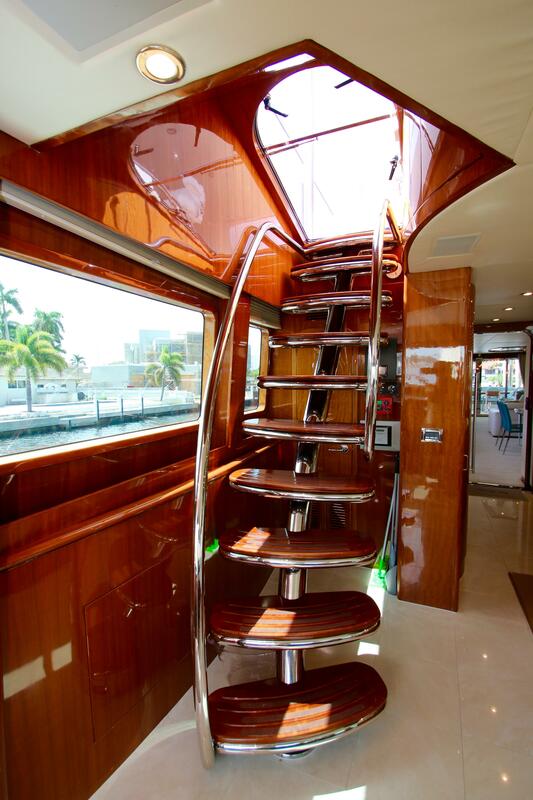 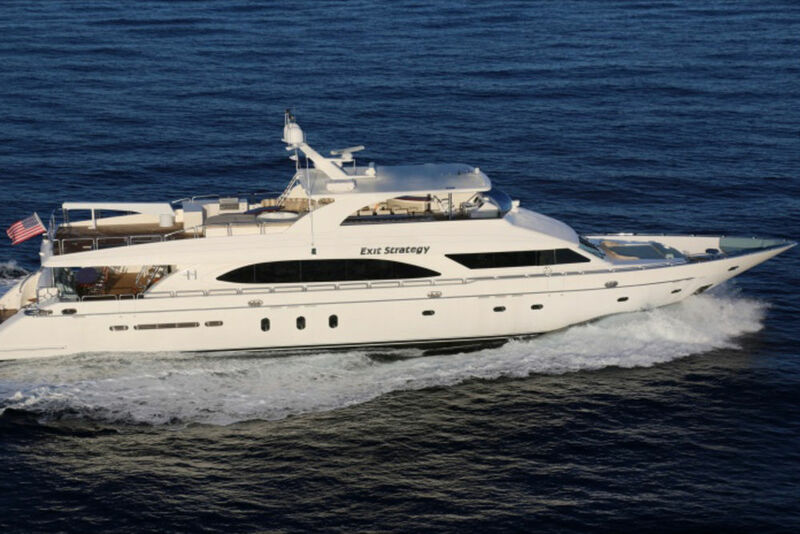 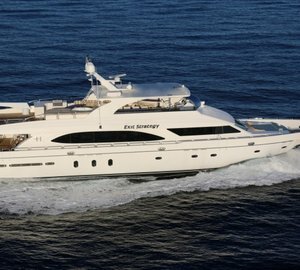 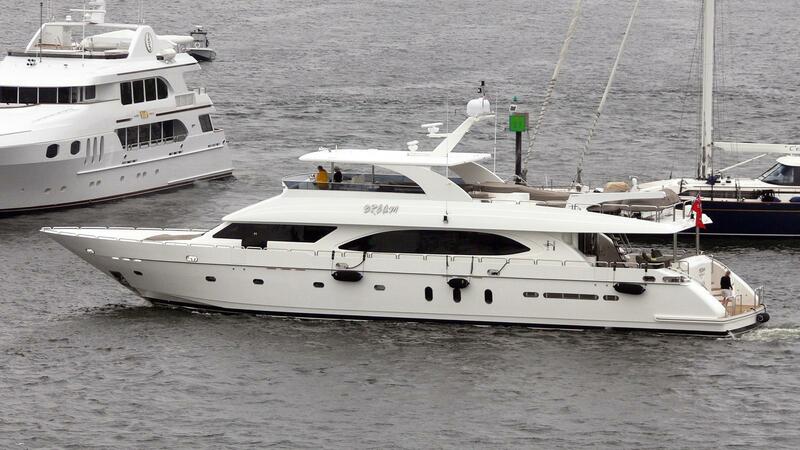 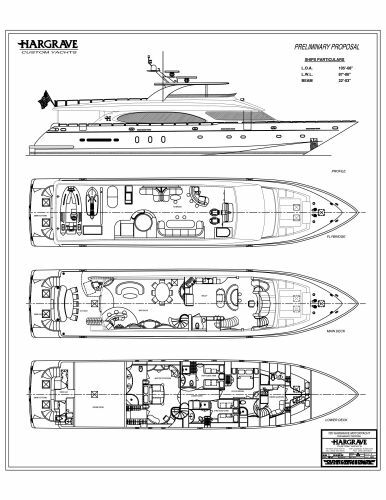 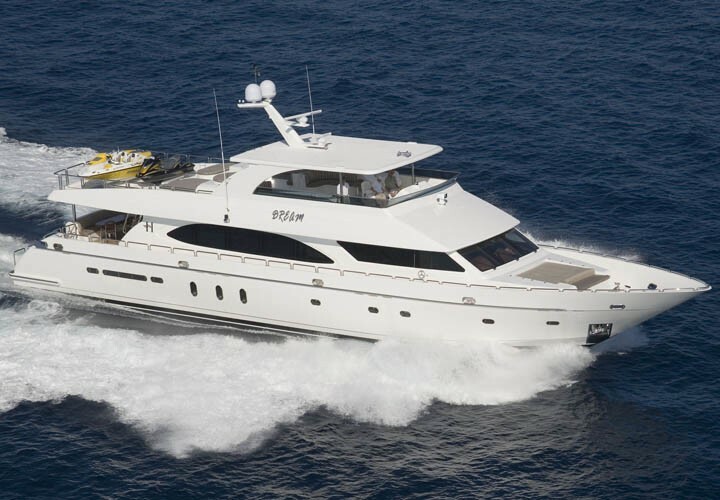 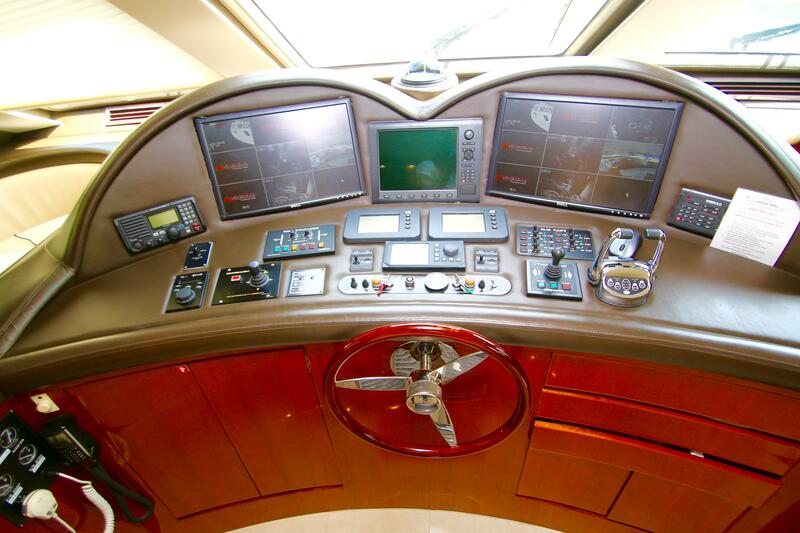 Luxury yacht EXIT STRATEGY (Ex DREAM) was delivered by Hargrave in 2006 and measures 32m (105ft). 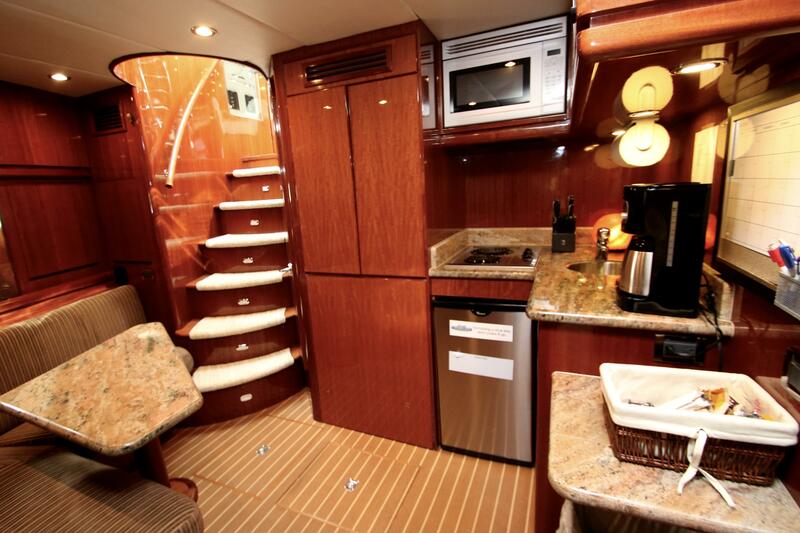 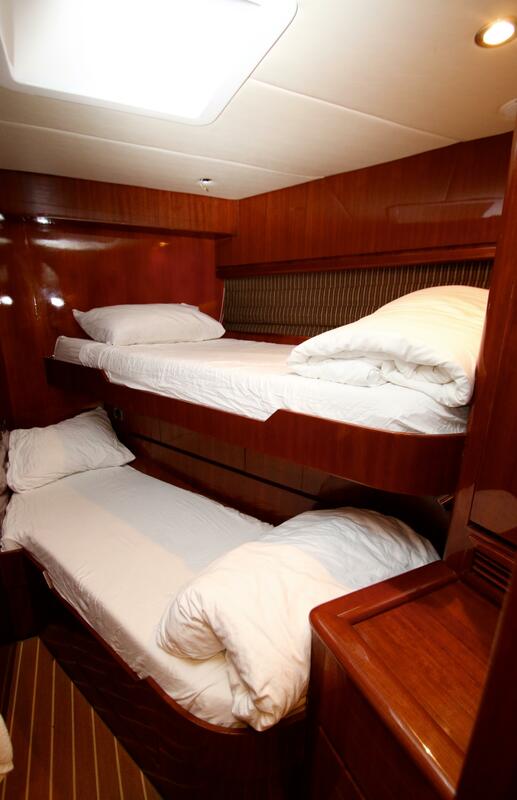 She boasts deluxe accommodation for up to 8 guests in 4 spacious cabins. 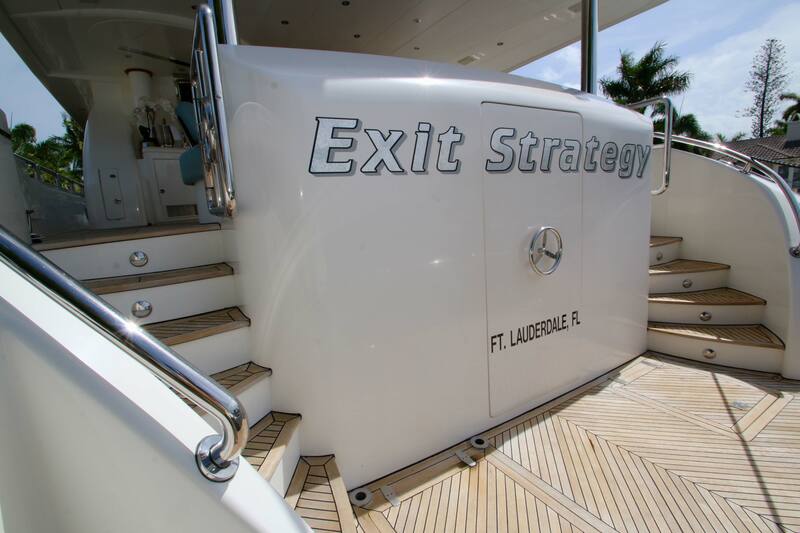 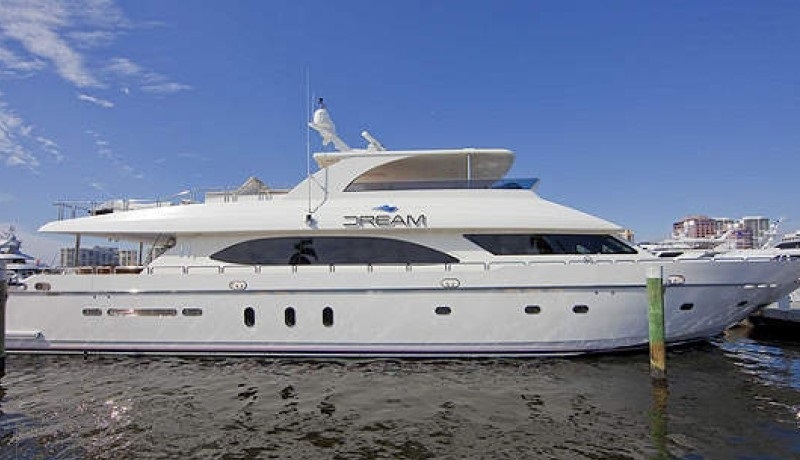 EXIT STRATEGY'S NOTABLE FEATURES: Extended swim platform ~ Lots of water toys ~ Jacuzzi on Open Bridge ~ Large exterior living ~ Ample and elegant interior spaces ~ Ideal for groups. 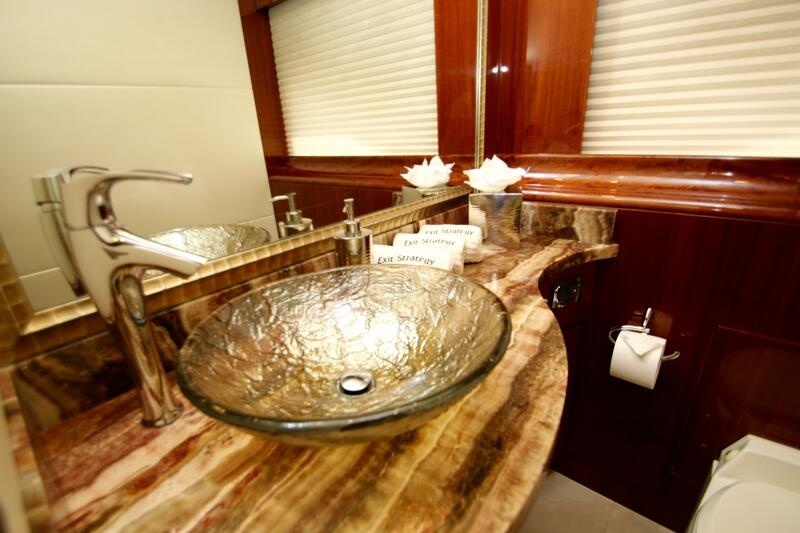 A stylish interior of rich leather soft furnishings, fine African mahogany and smooth South American marble exuding sophistication, while retaining a welcoming atmosphere. 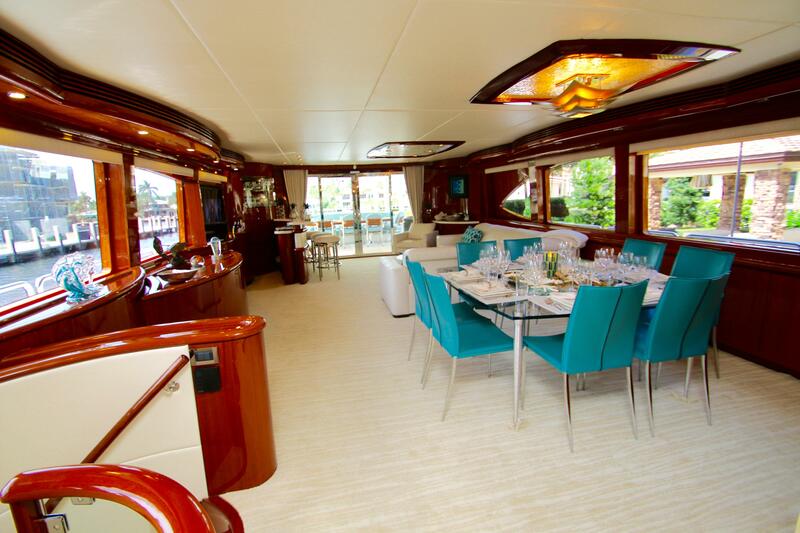 The salon and dining are an open plan a fabulous space to entertain. 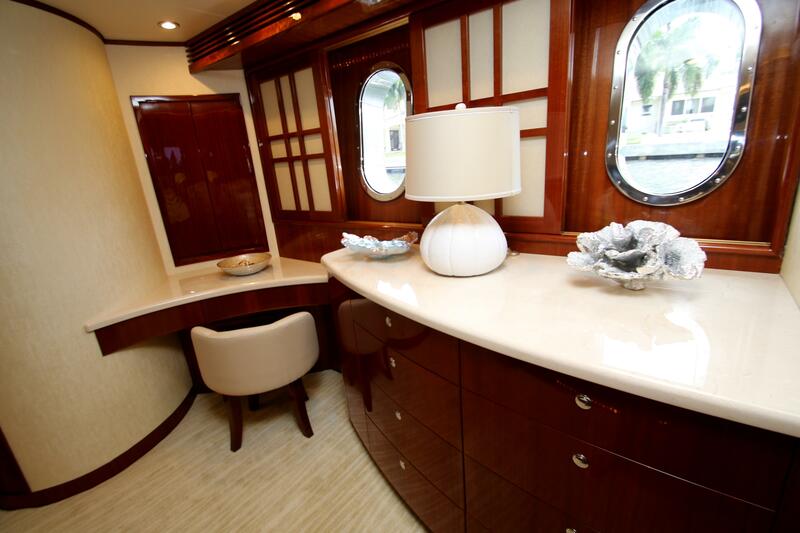 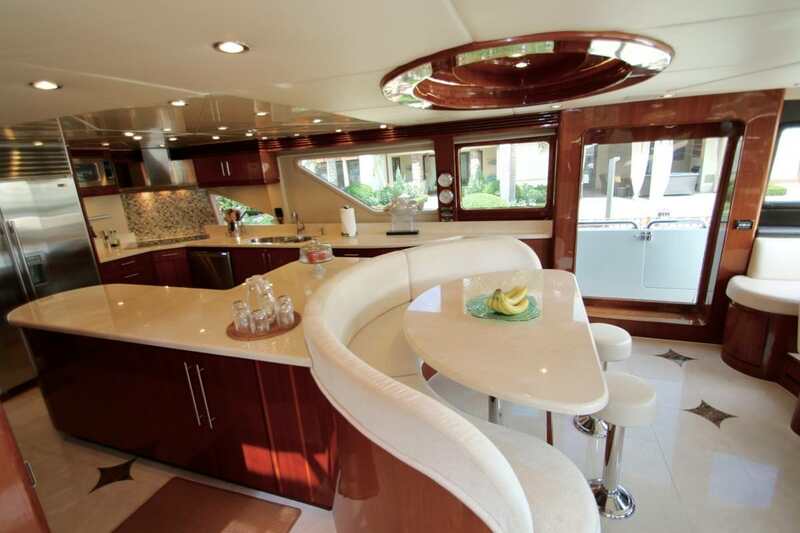 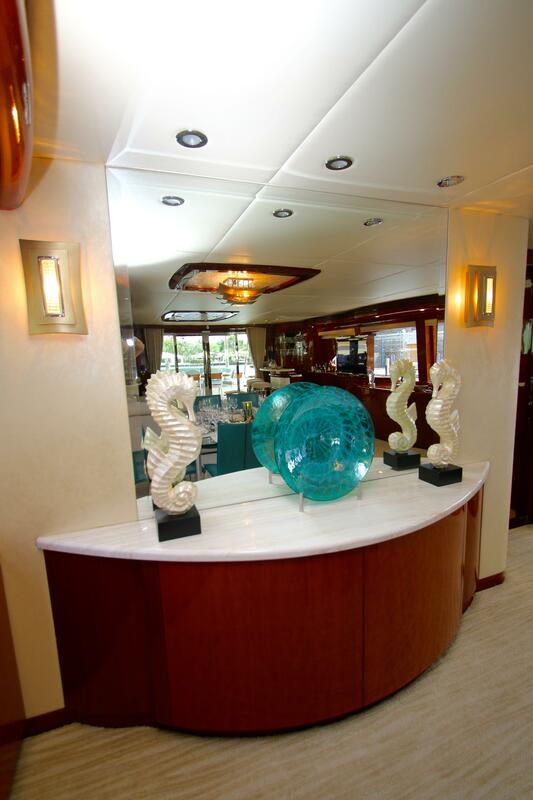 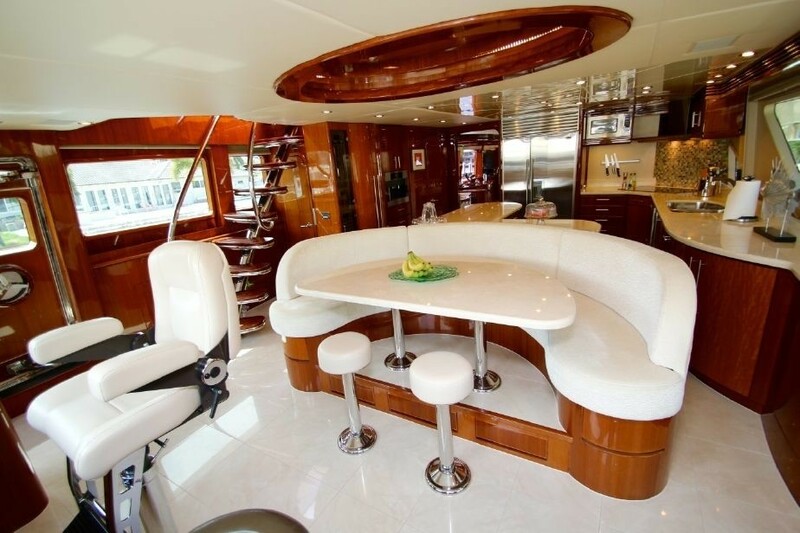 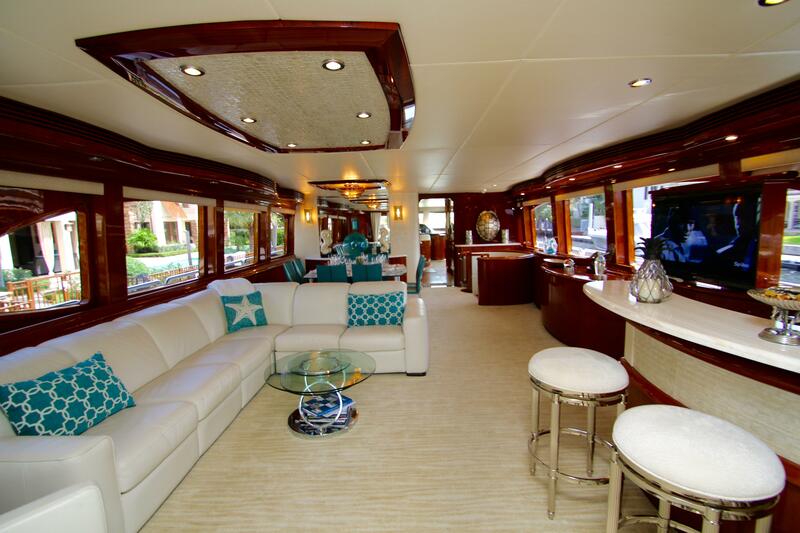 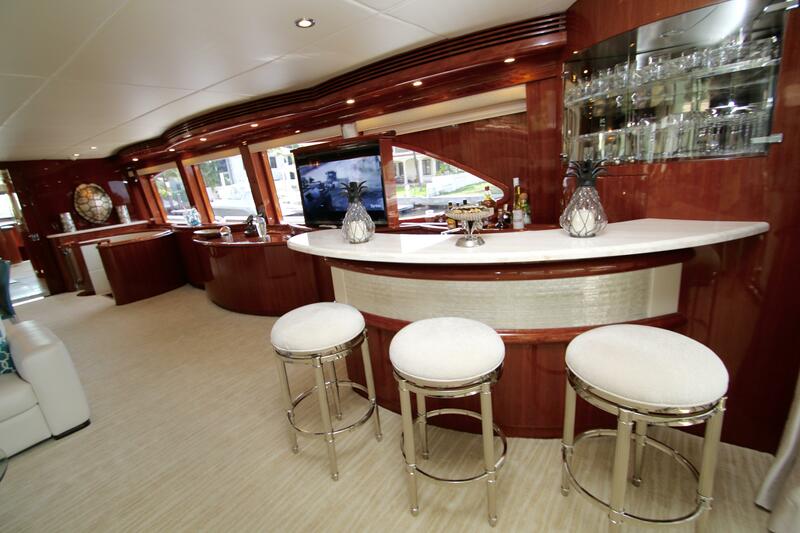 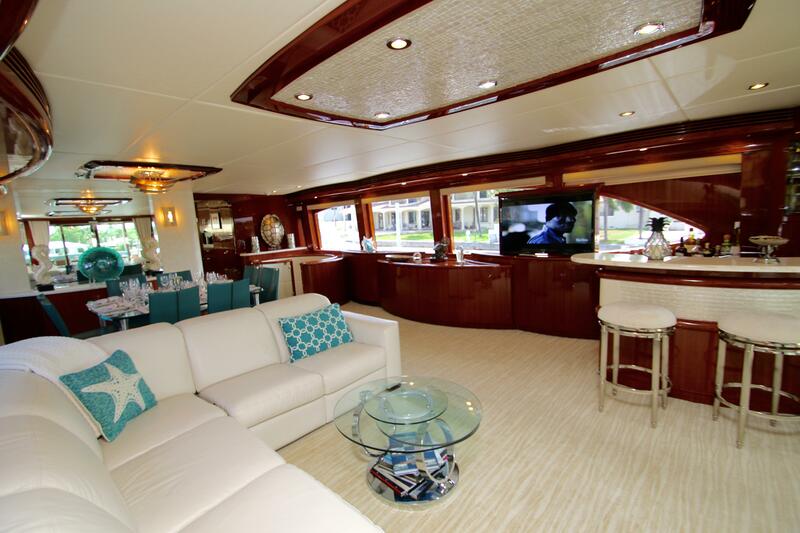 The lounge is aft and on port with an elongated L shaped leather sofa, to starboard is a marble topped wet bar and pop up flat screen TV with full entertainment system. 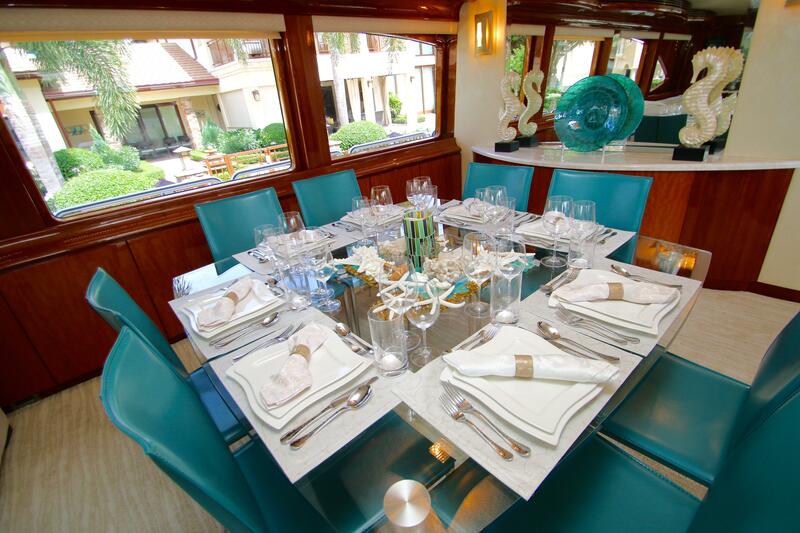 Forward of the lounge, a clear glass formal dining table ties the space together with a casual elegance. 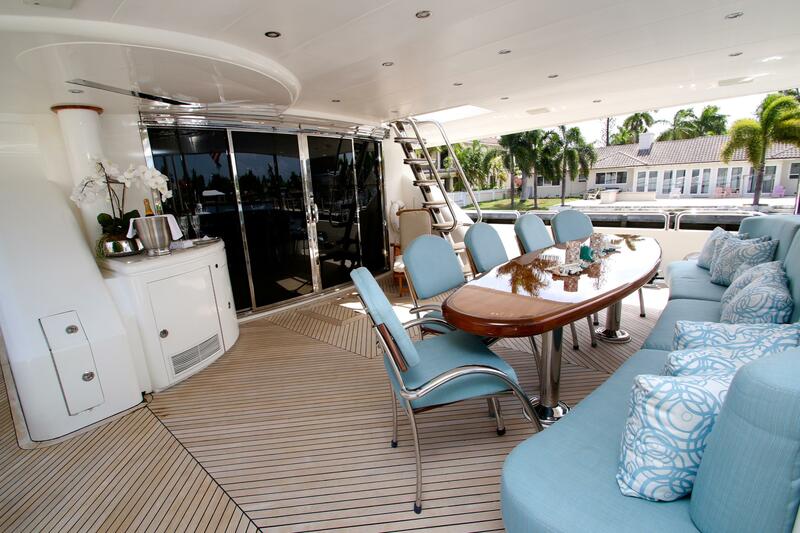 Large panoramic windows allow in plenty of natural light, enhancing the exquisite craftsmanship and detailing. 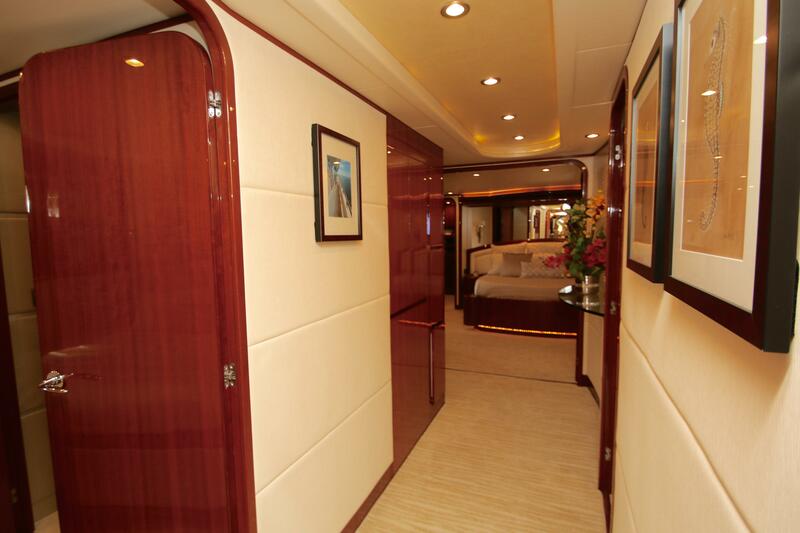 Further forward a hall leads to the large open style galley, a small seating area with table and helm station. 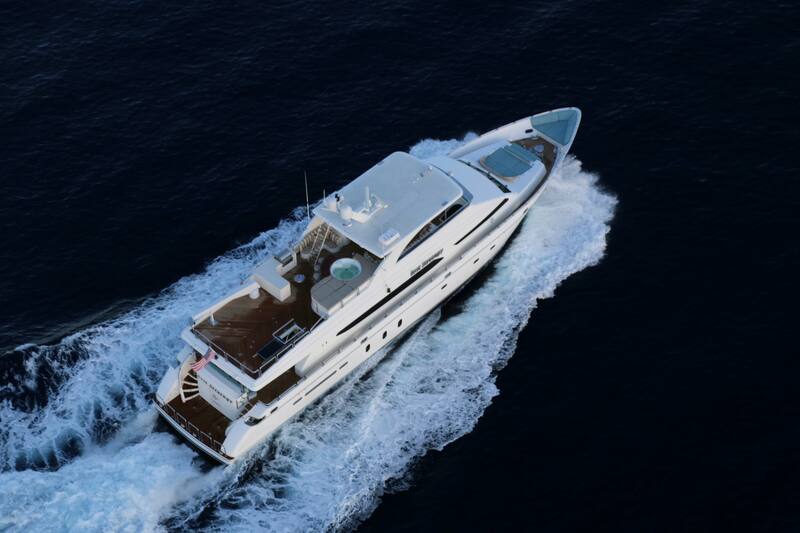 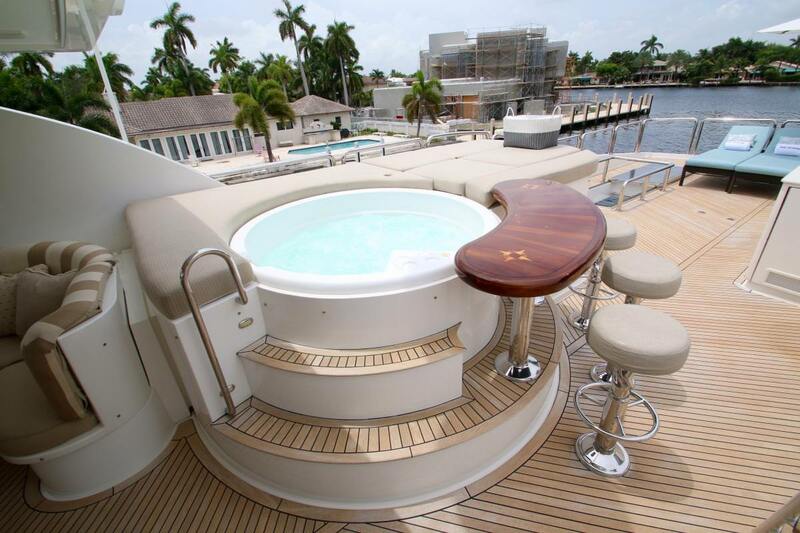 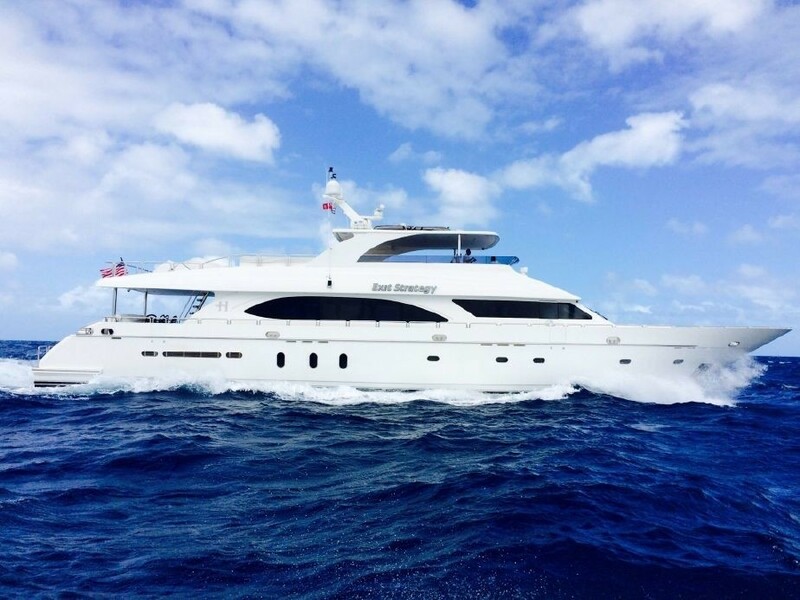 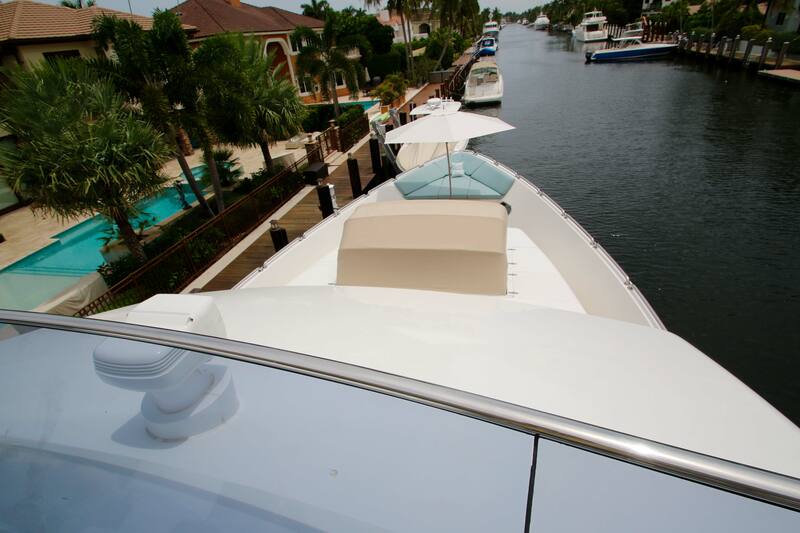 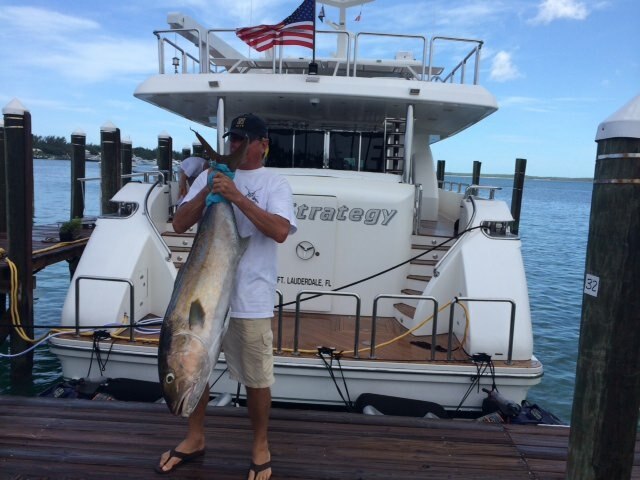 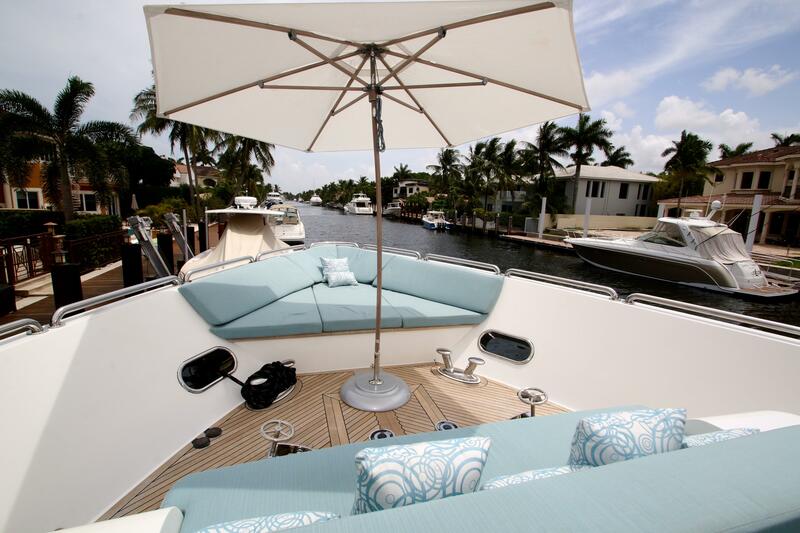 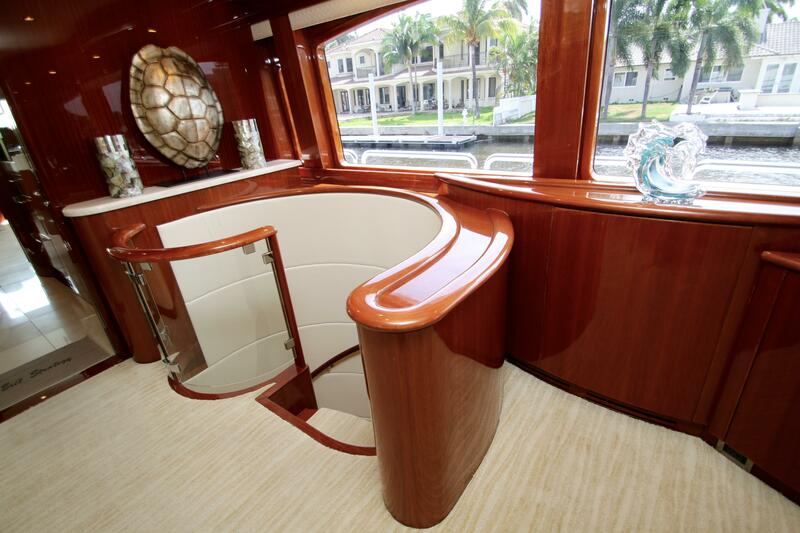 EXIT STRATEGY boasts ample exterior living, ideal for the warmer climates of Florida and the Bahamas. 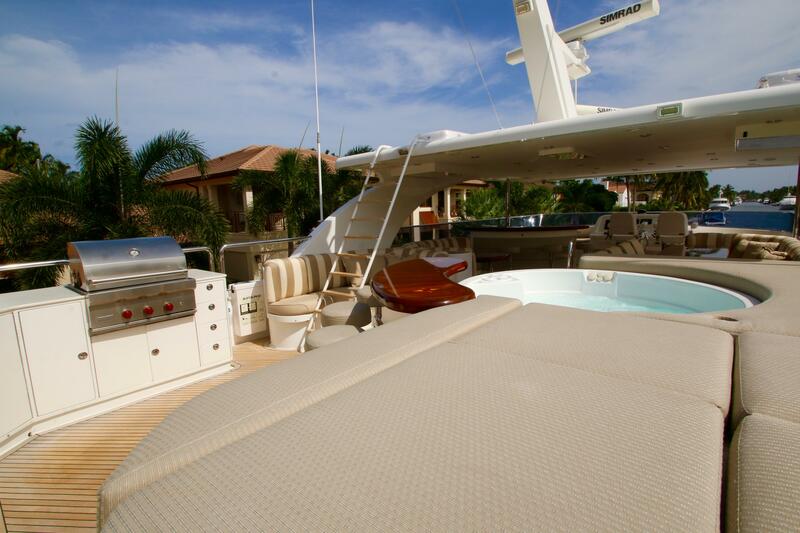 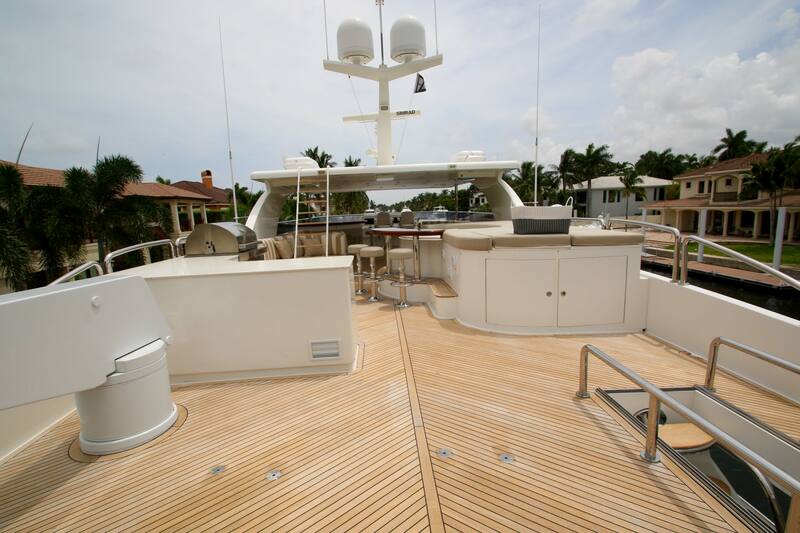 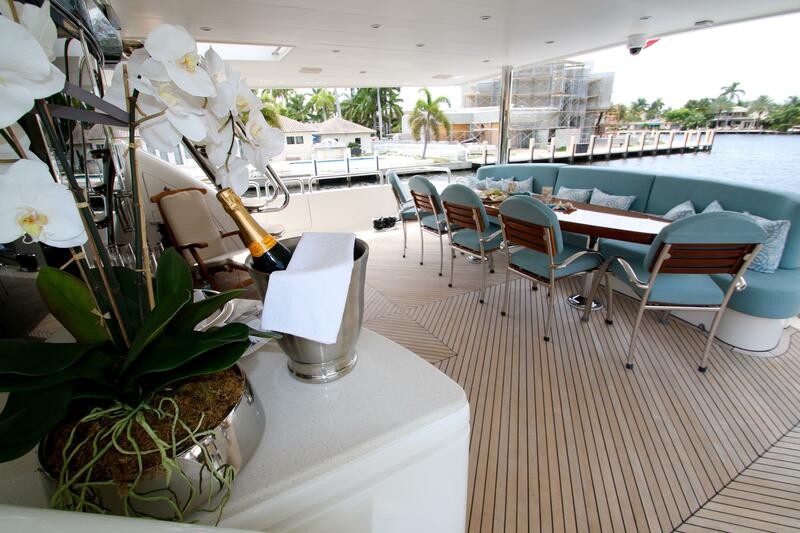 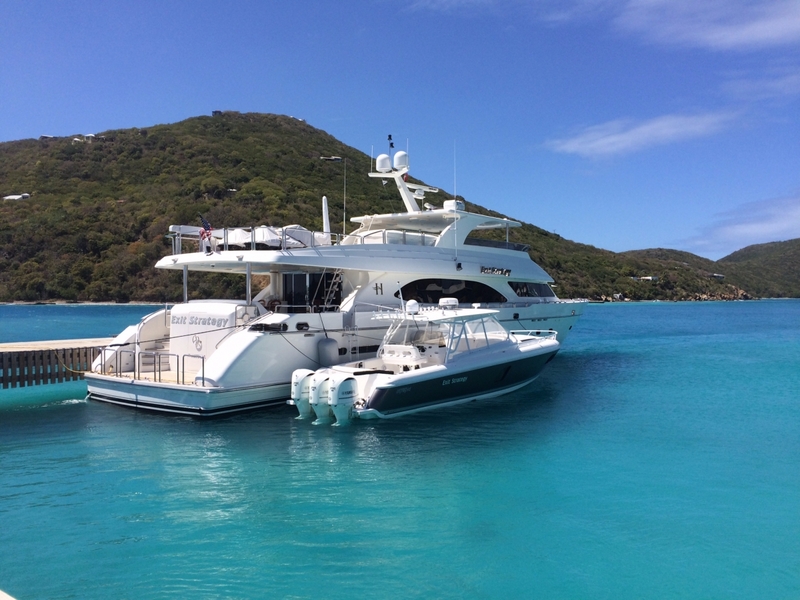 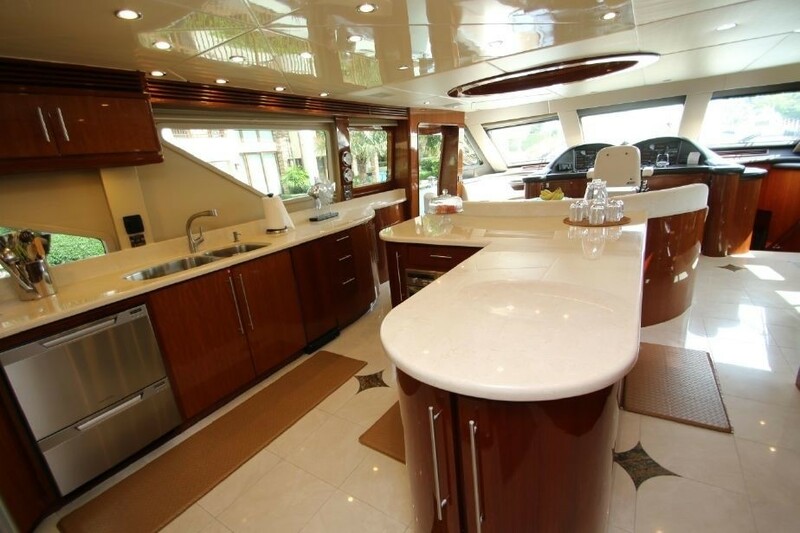 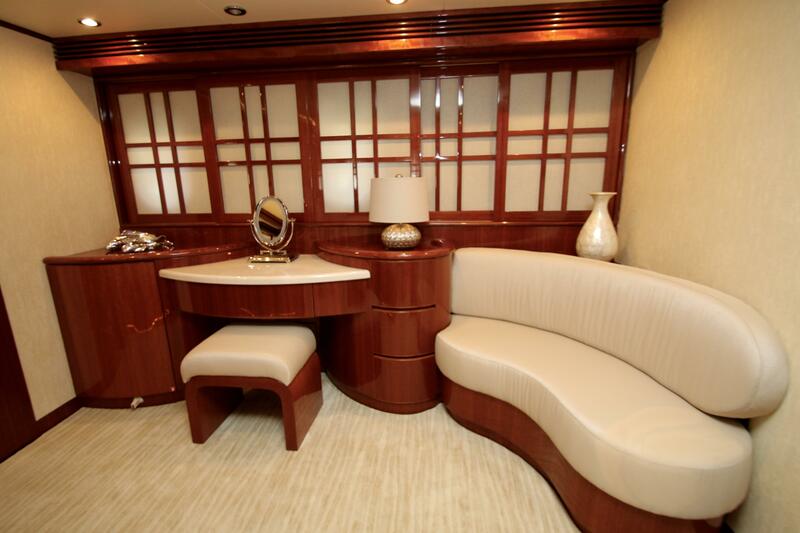 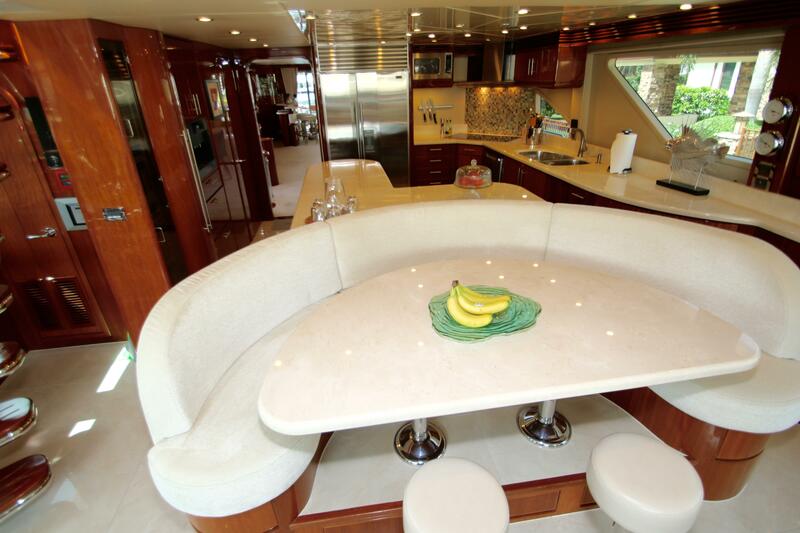 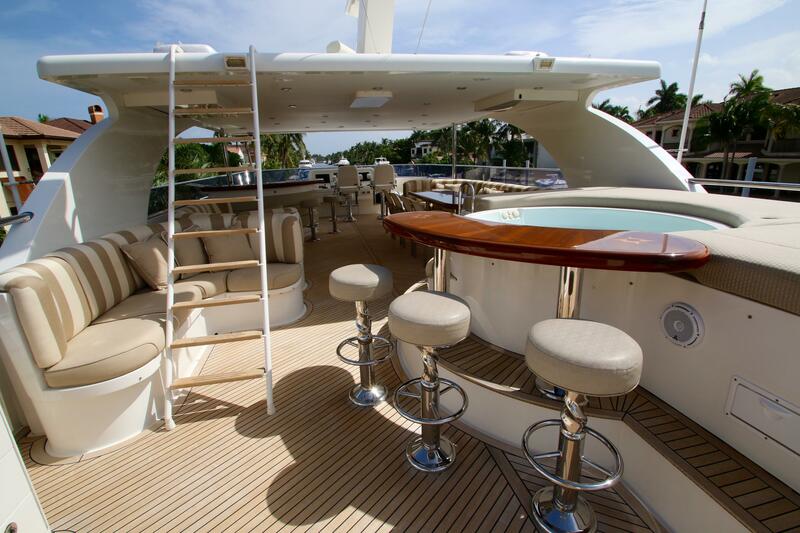 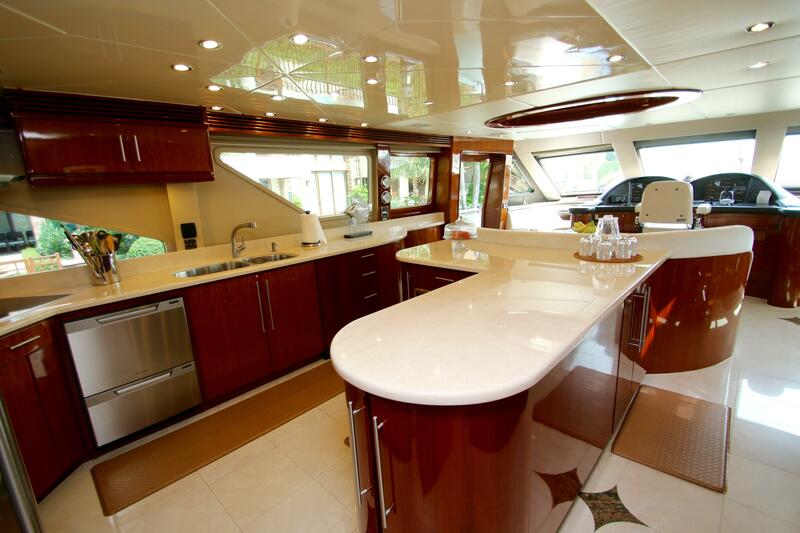 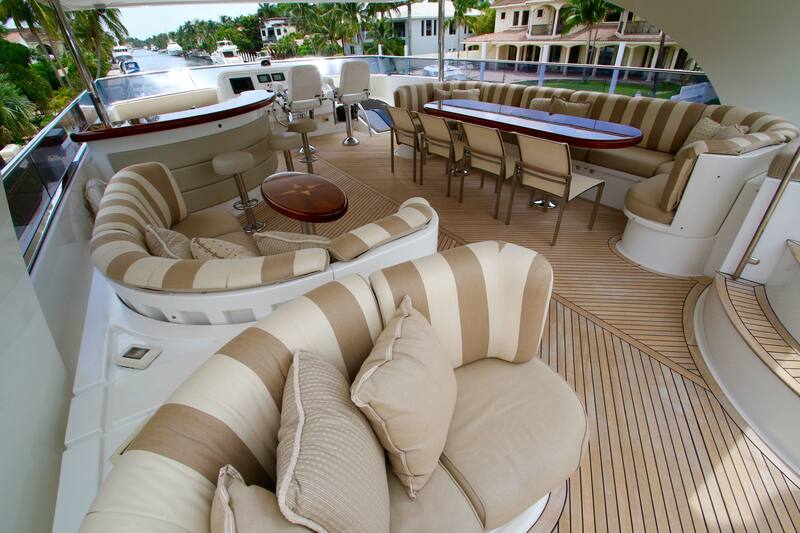 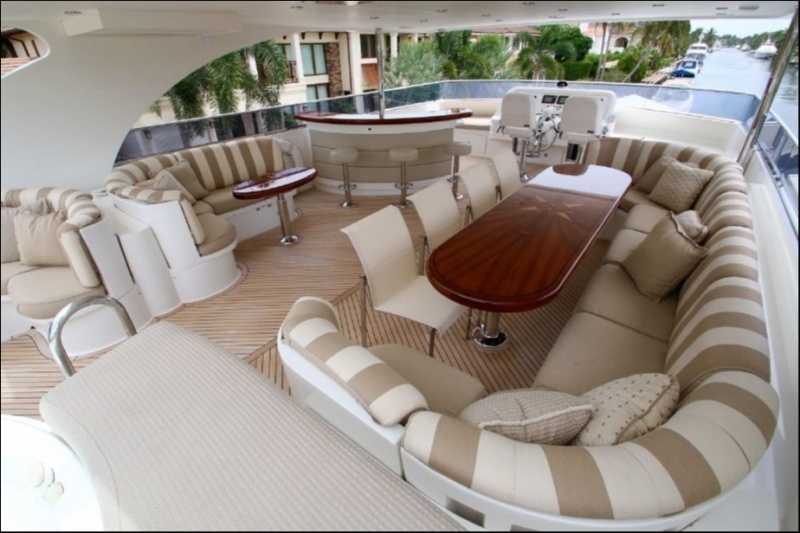 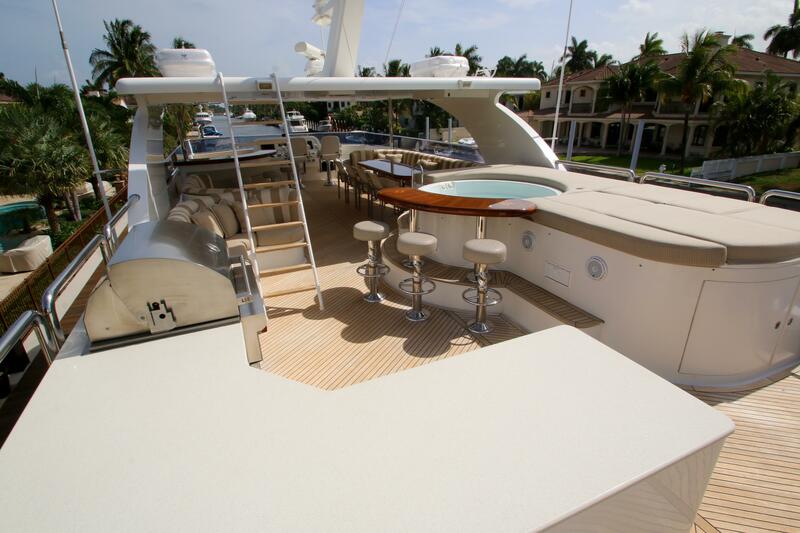 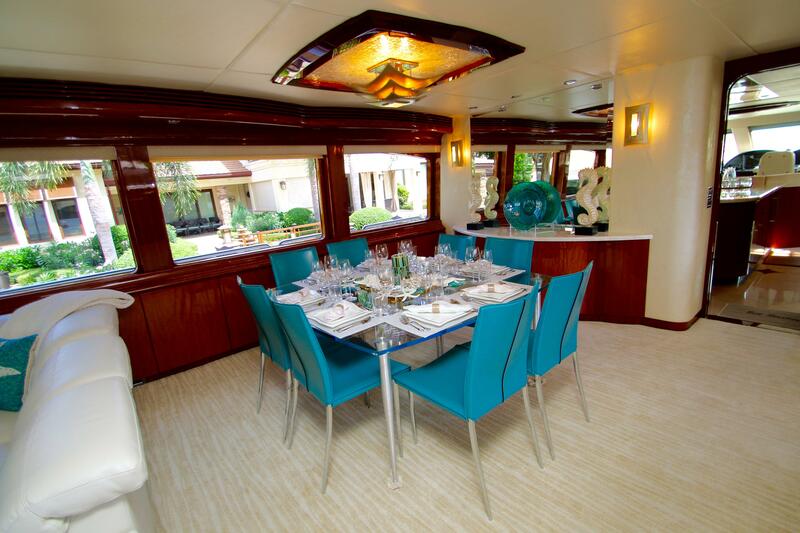 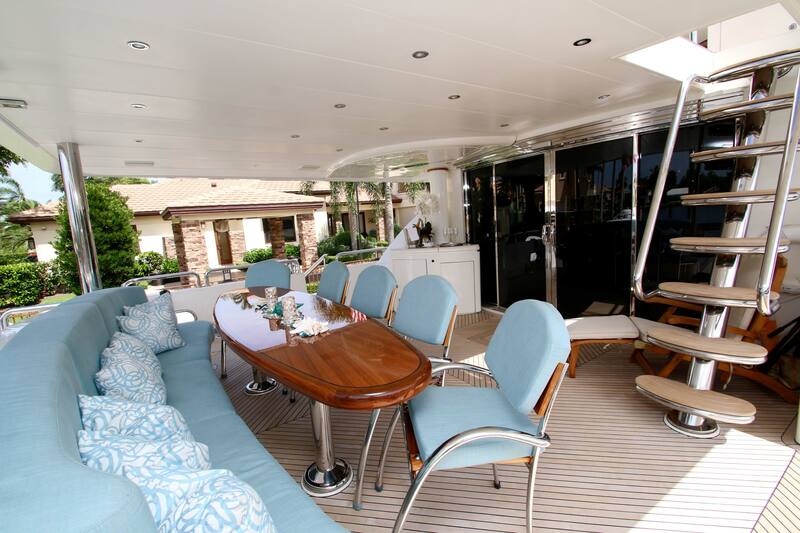 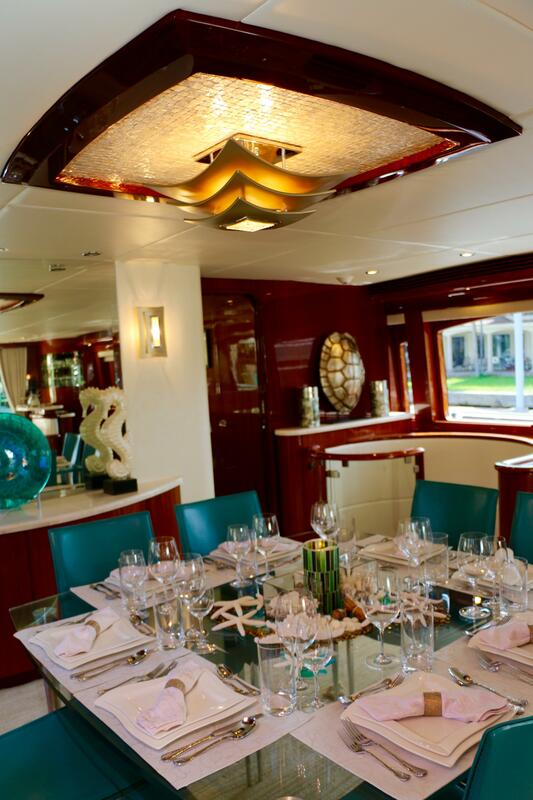 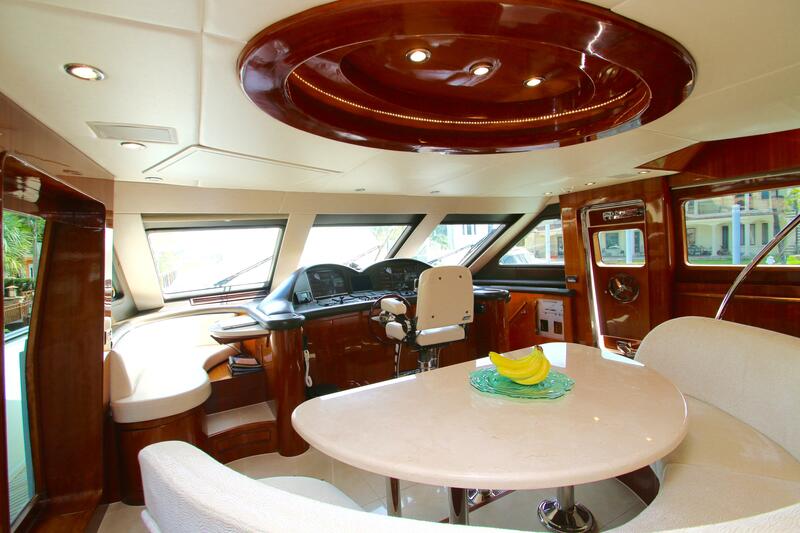 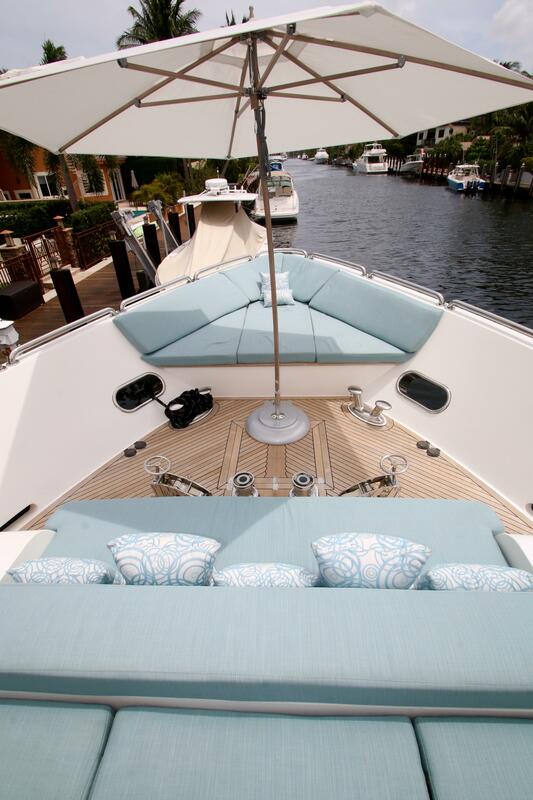 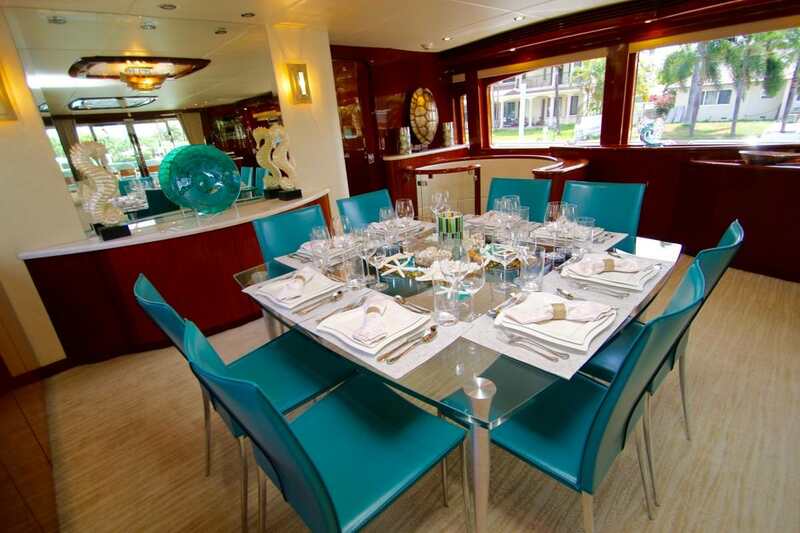 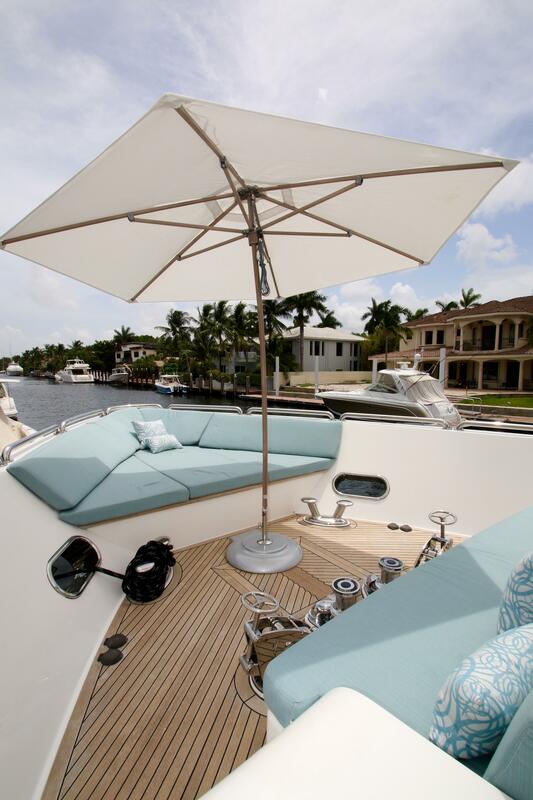 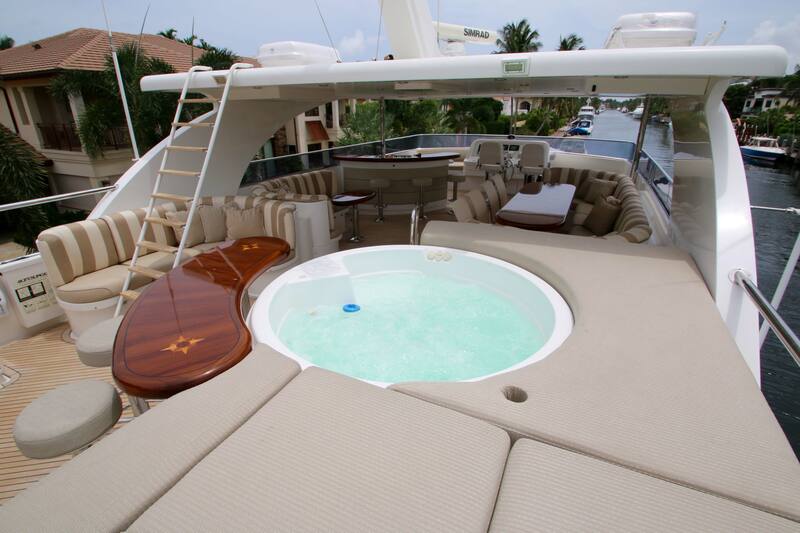 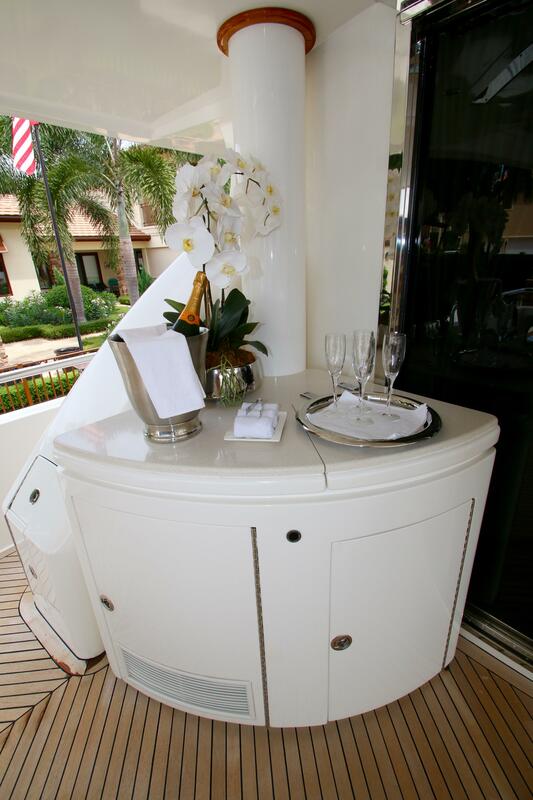 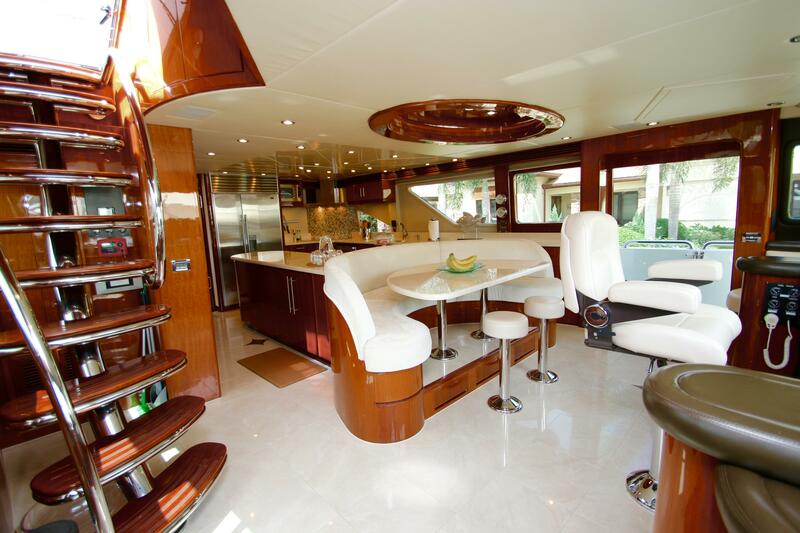 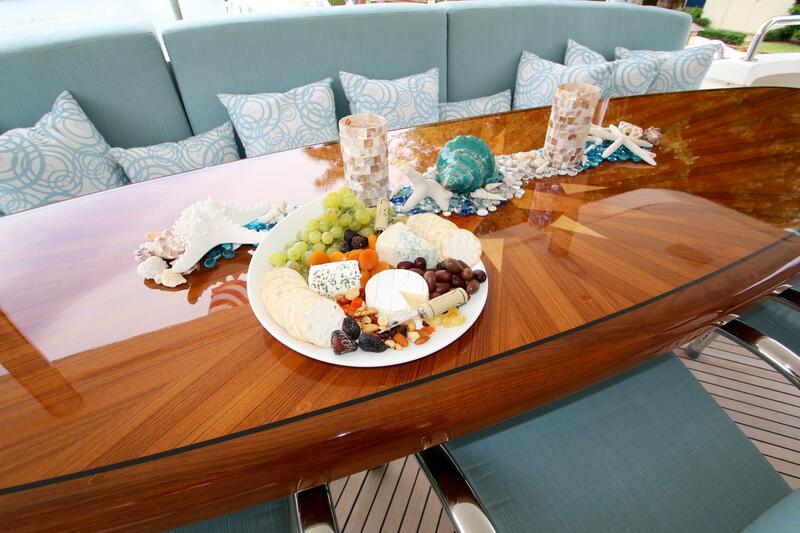 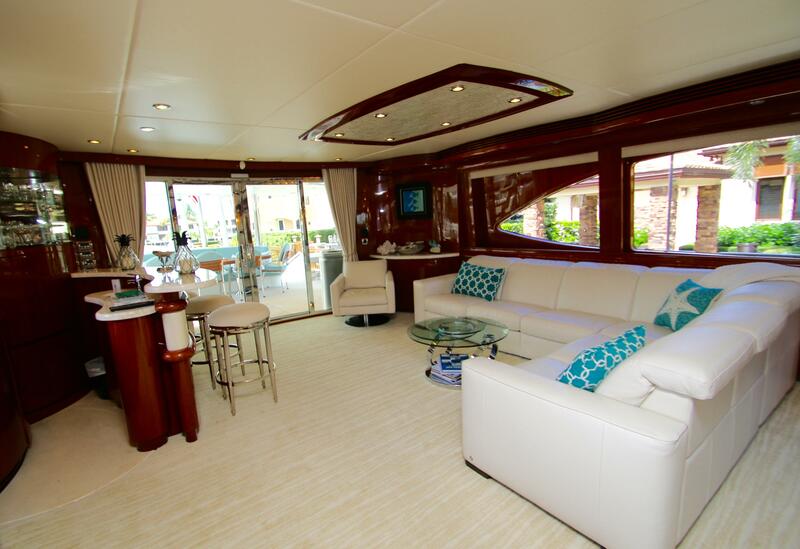 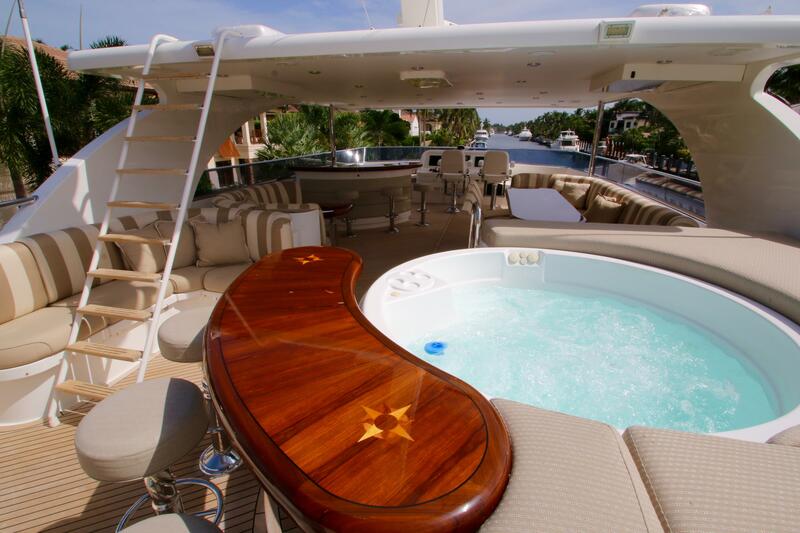 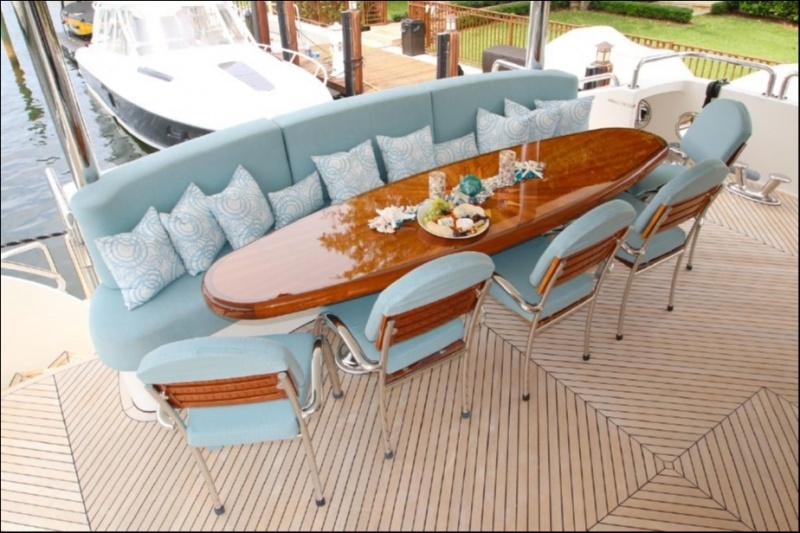 The aft deck is shaded and offers an alfresco dining option, additional built in seating area and drop down TV. 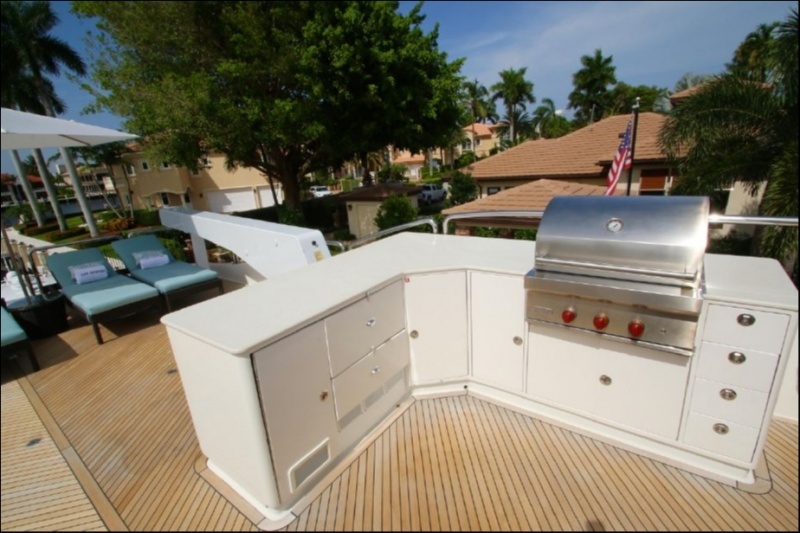 Further aft, the full beam extended swim platform was designed with easy access wide steps and stainless hand rails for added safety. 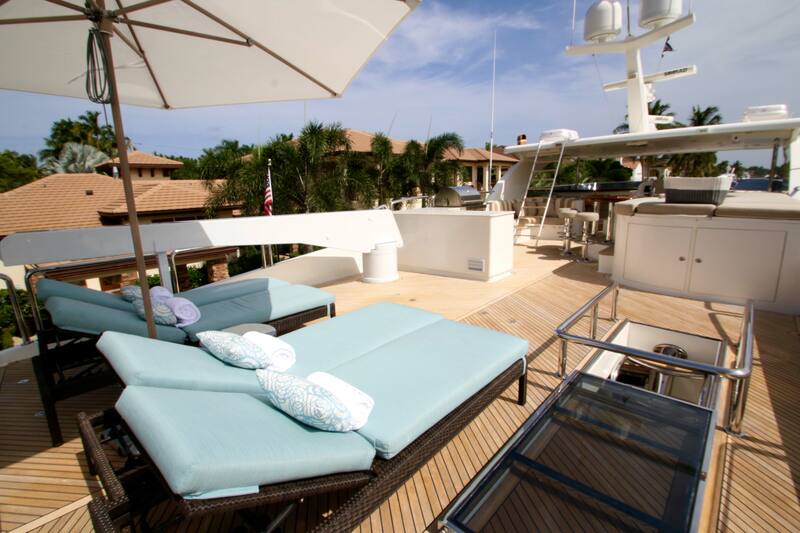 There are wrap around teak decks, and on the main deck guests will find an idyllic forward seating space and double sunpad. 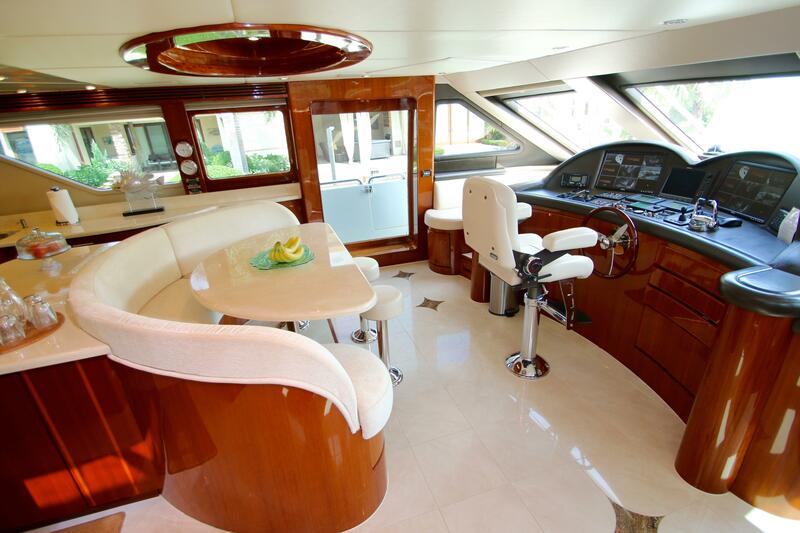 Above the main deck is a flybridge more commonly known on the Hargrave as the ‘Open bridge’, offering something for everyone. 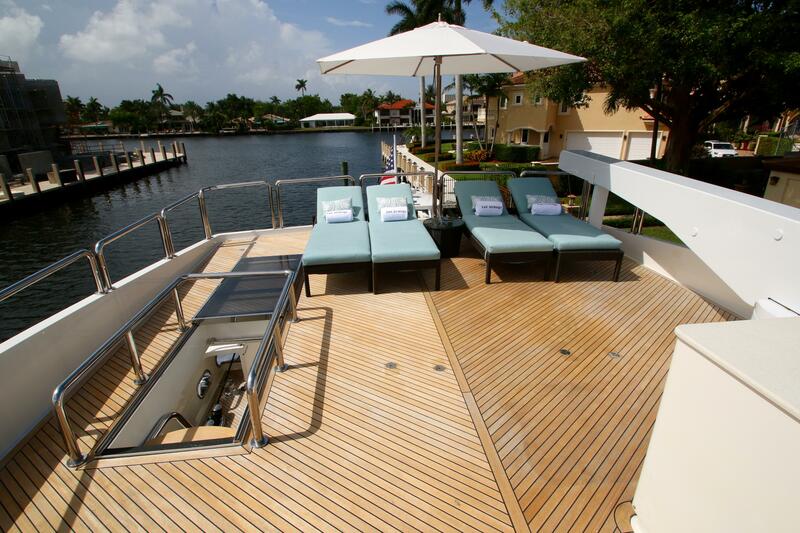 It is the perfect deck to entertain large or small groups. 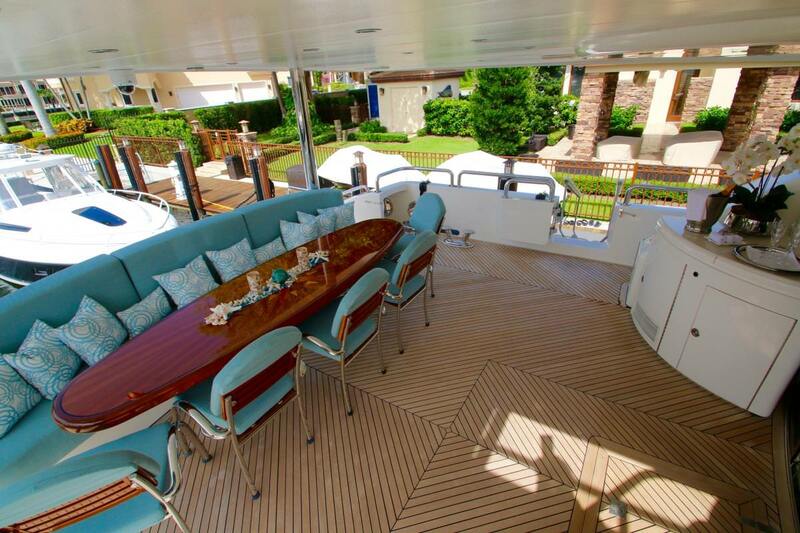 The deck is complete with plenty of sunpads and seating, partial shade, full wet bar, large BBQ and service area, alfresco dining option, cocktail table, Spa Pool tub with a bar top and cushioned covers to convert it into a further sunning space. 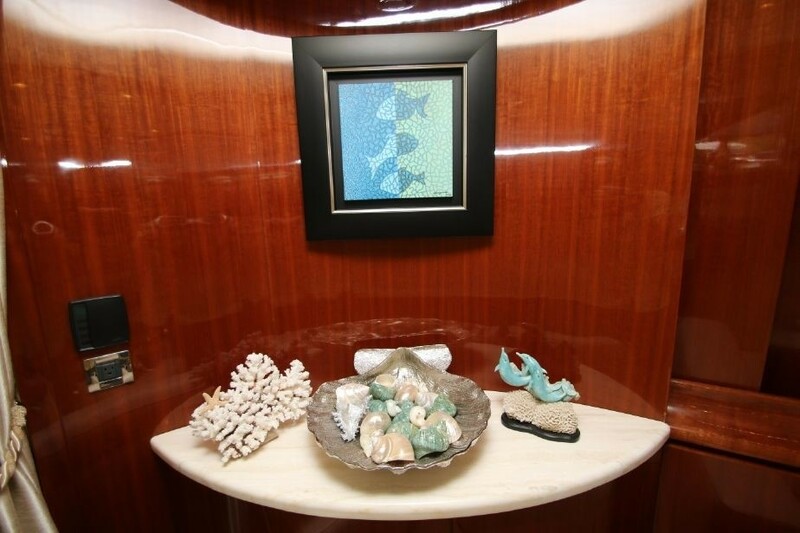 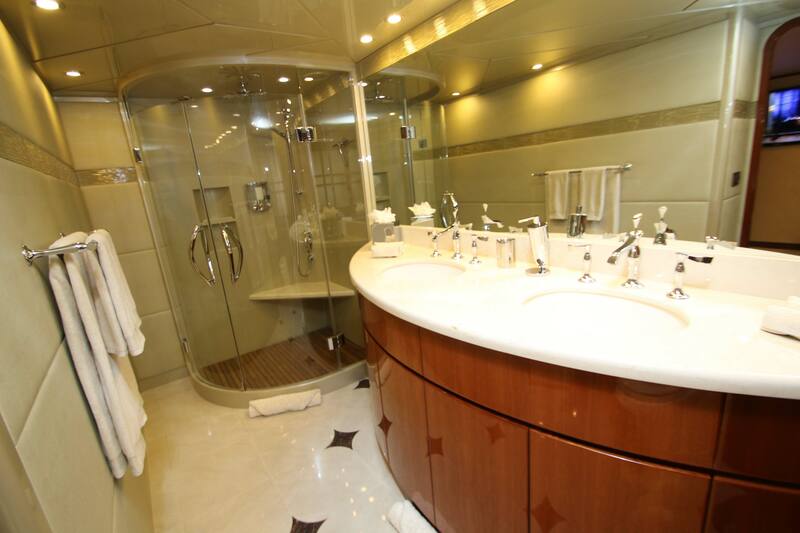 EXIT STRATEGY offers 4 generous cabins for up to 8 guests below decks, all accessed from the salon. 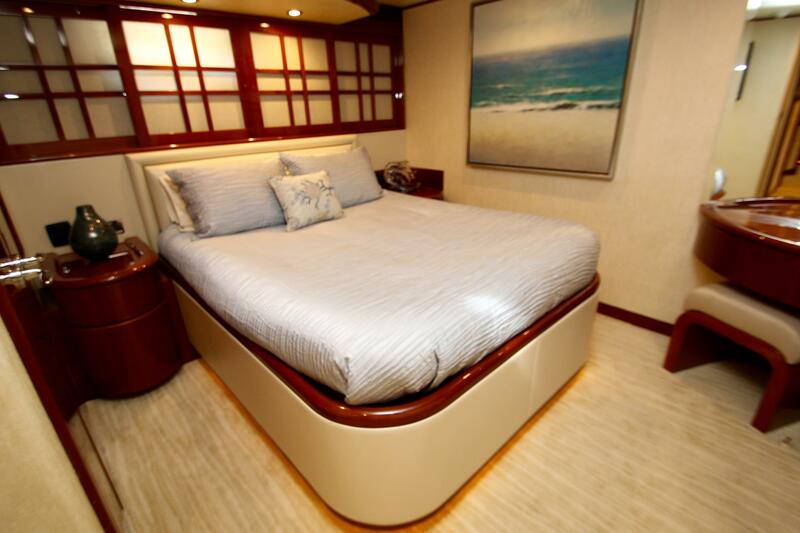 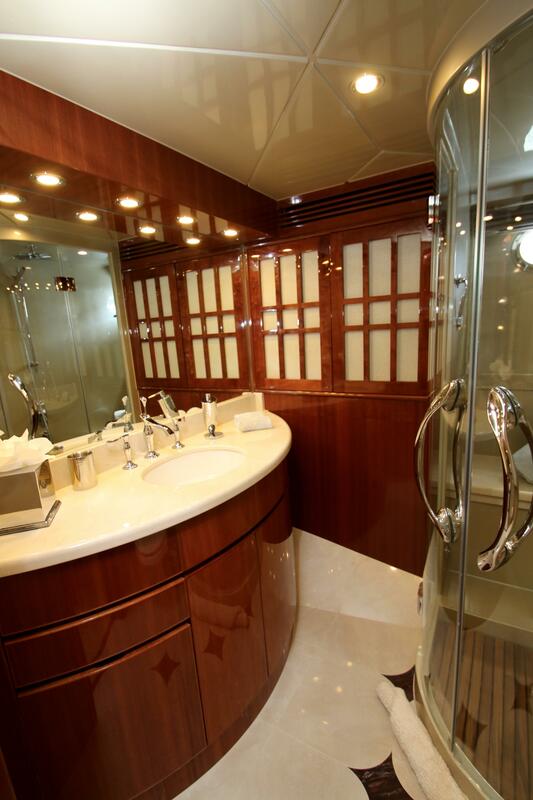 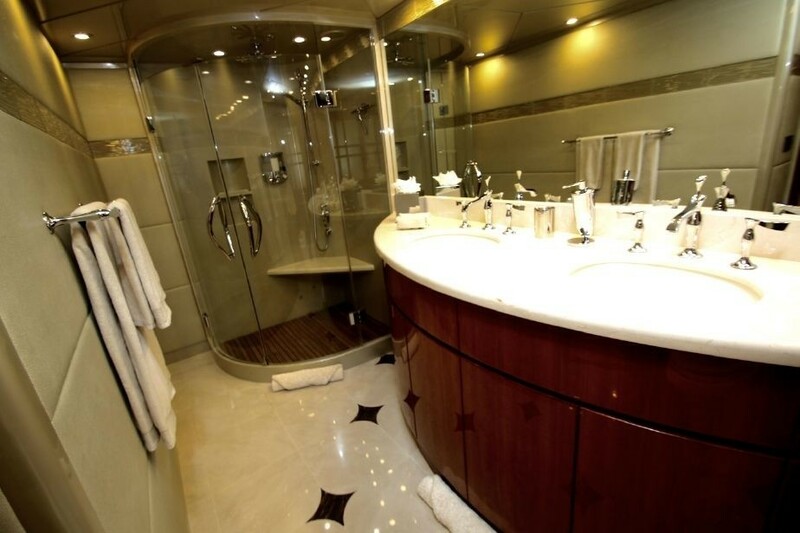 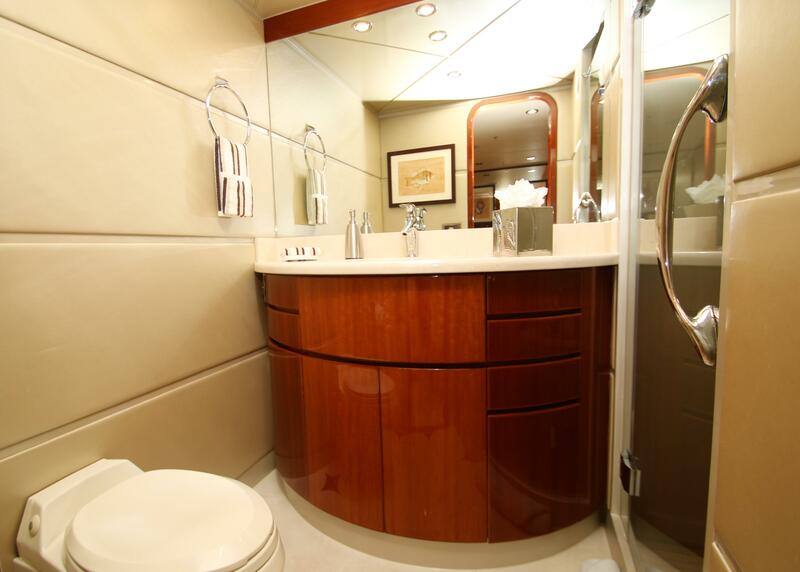 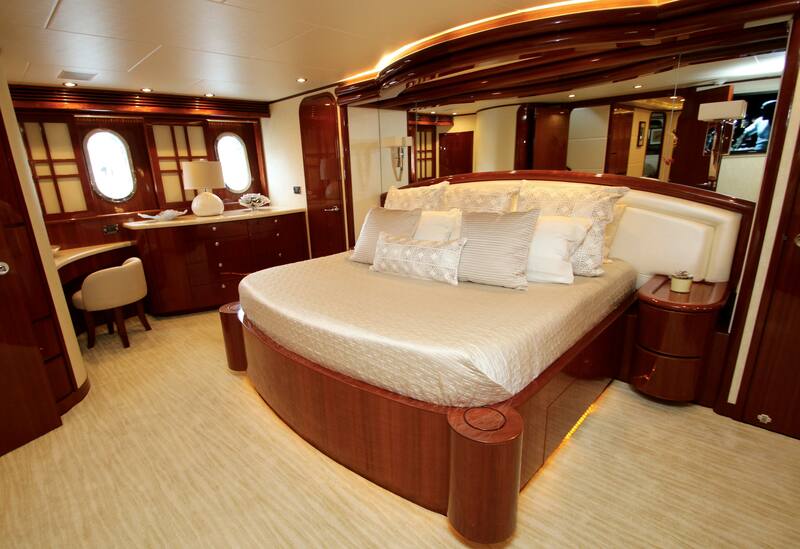 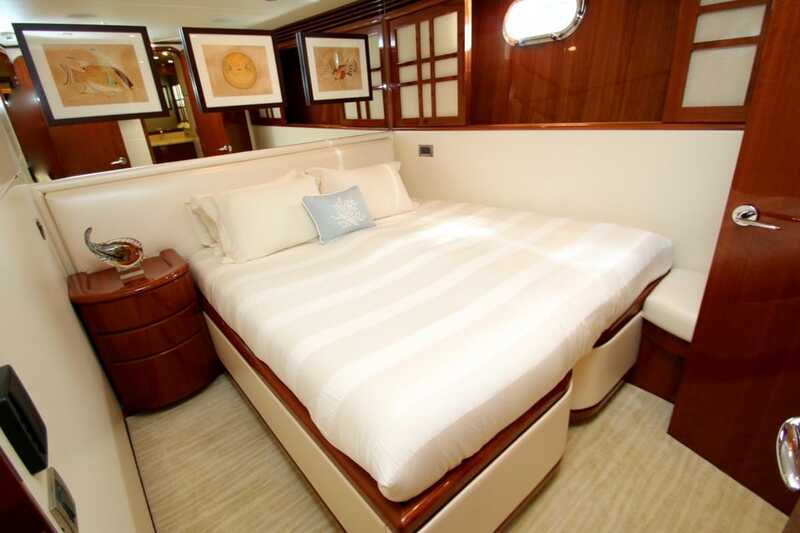 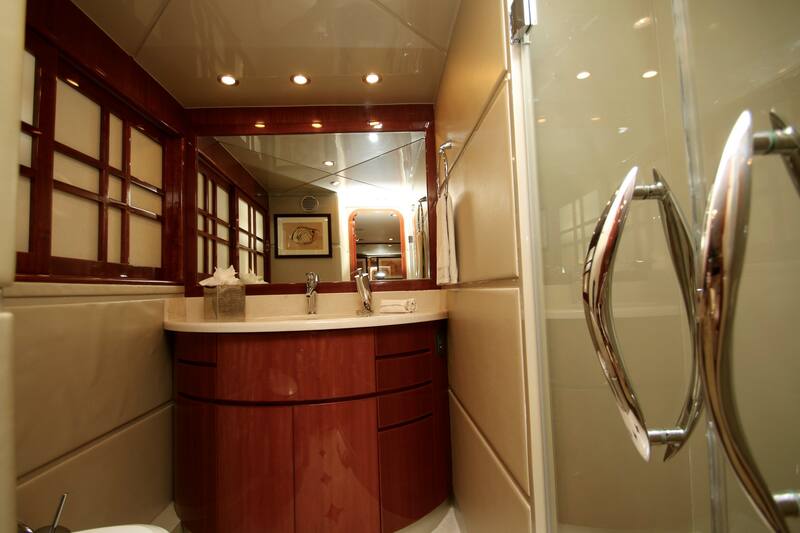 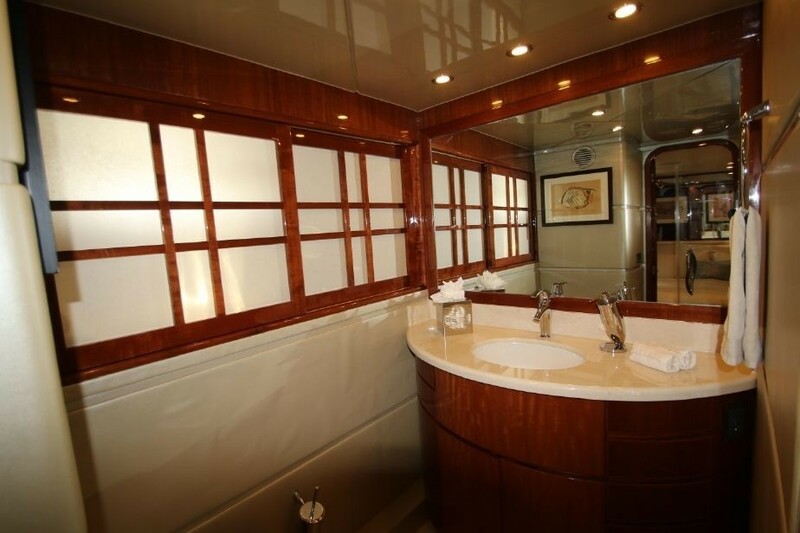 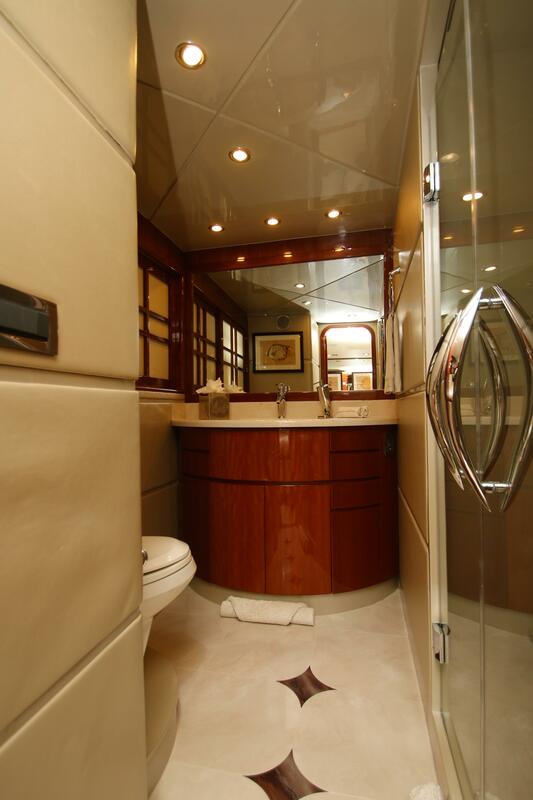 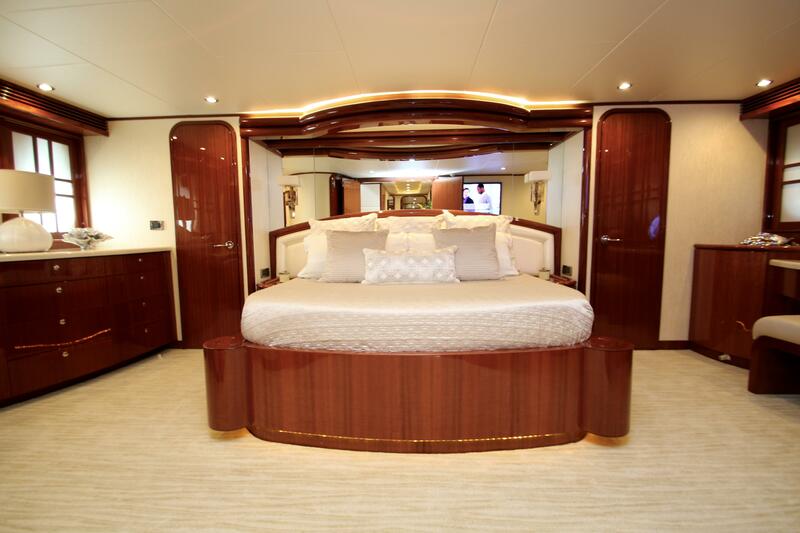 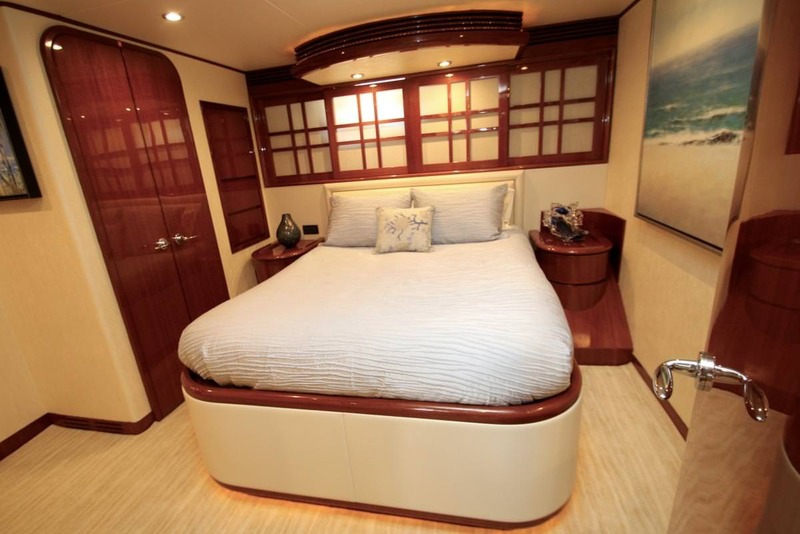 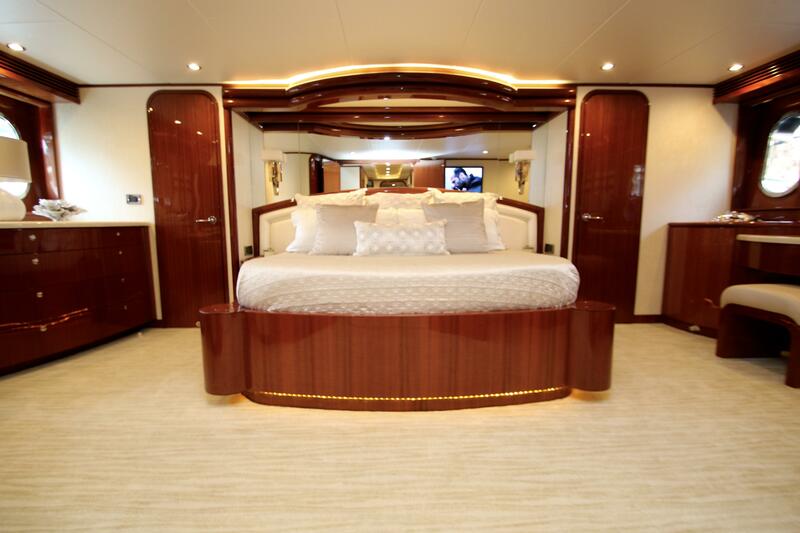 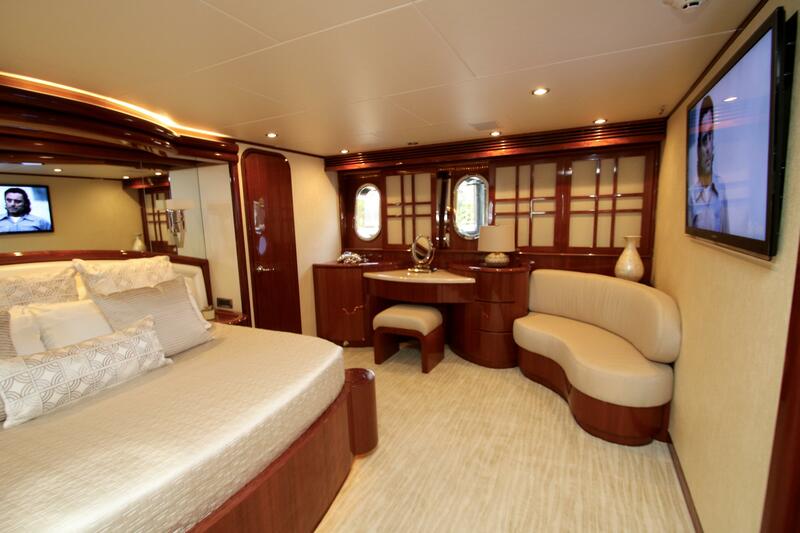 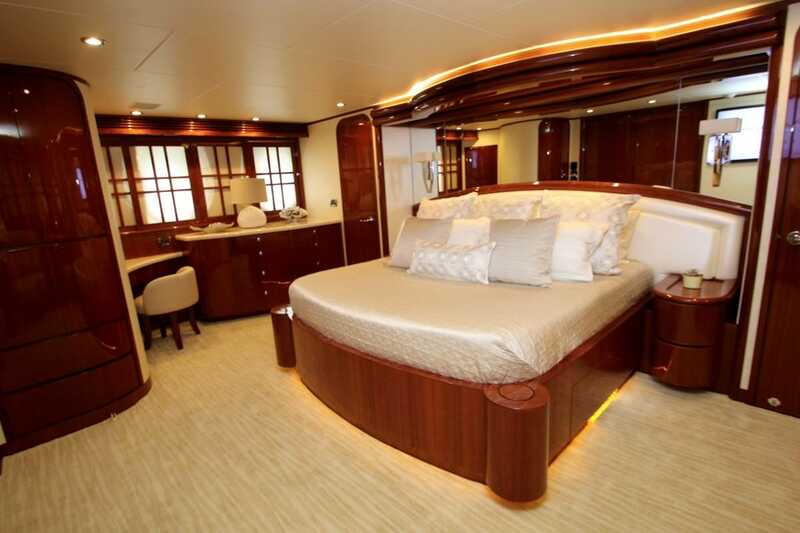 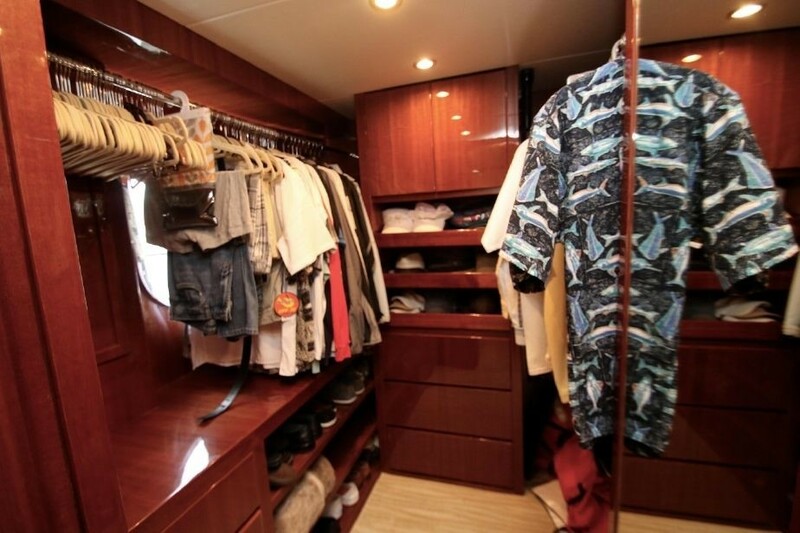 The master suite is amidships with a center lined bed, vanity, sofa, walk in wardrobe and en-suite facilities with his and hers sinks and large shower. 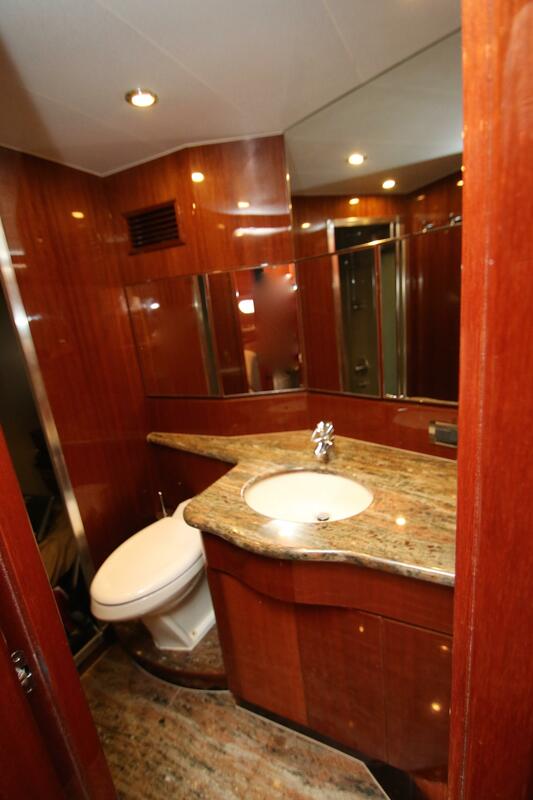 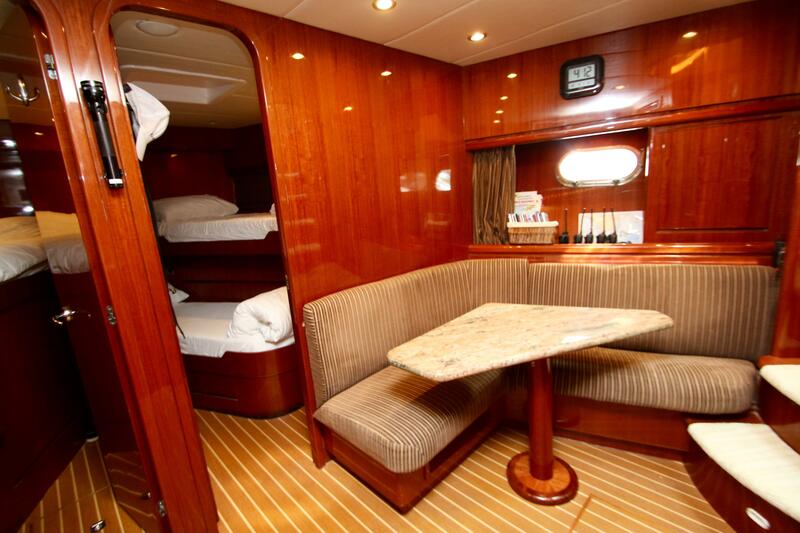 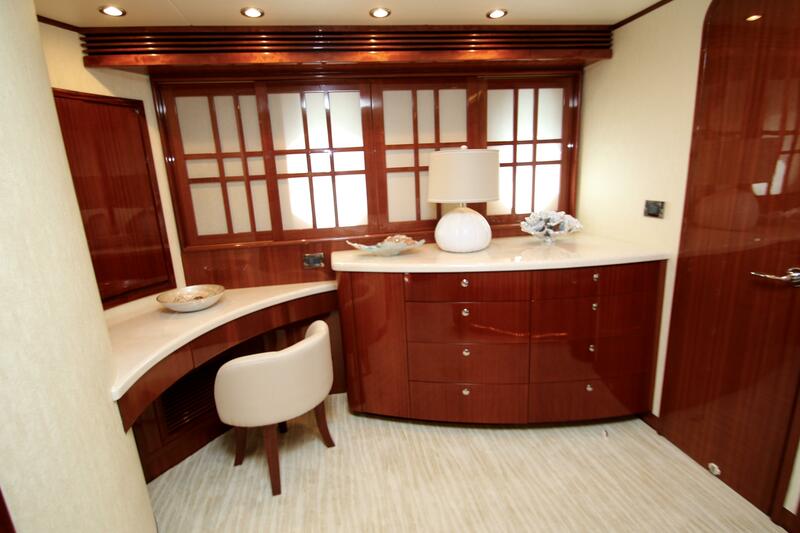 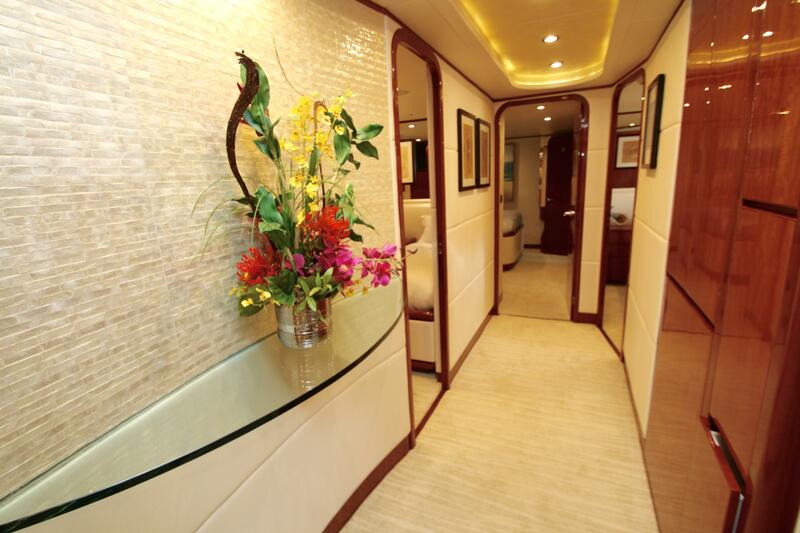 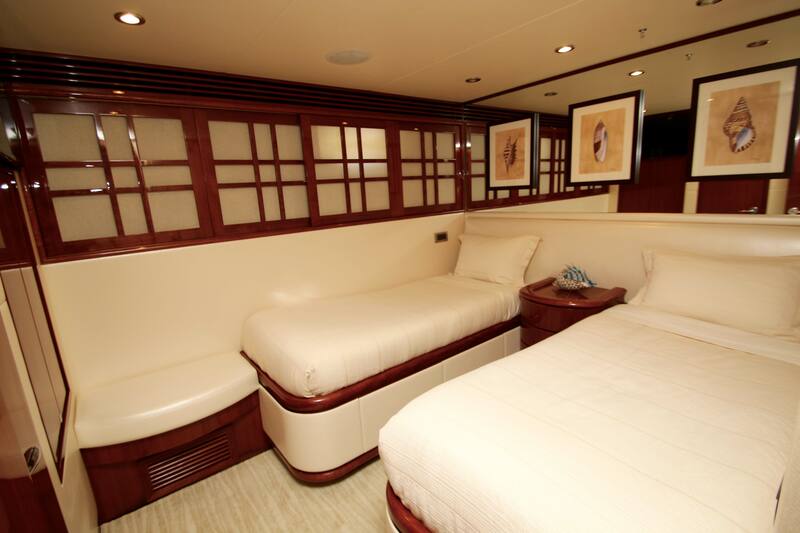 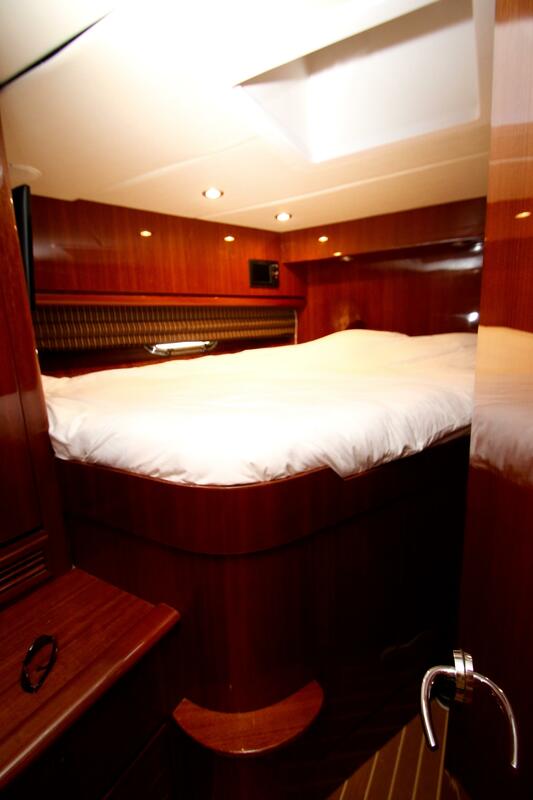 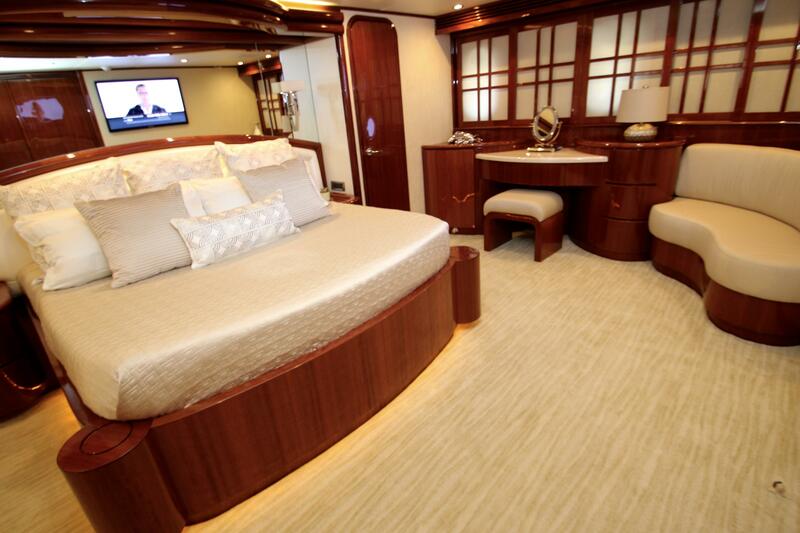 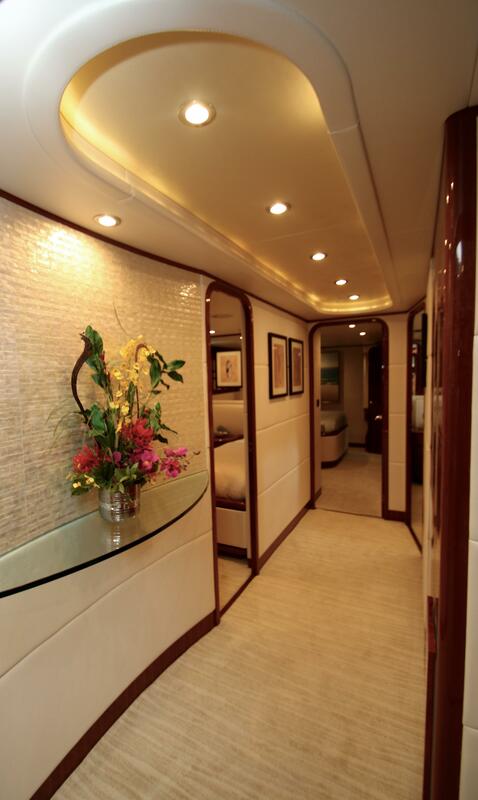 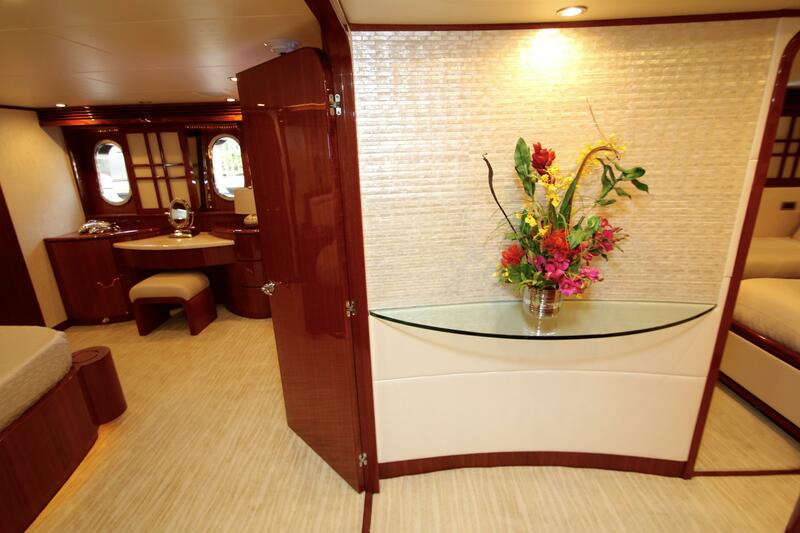 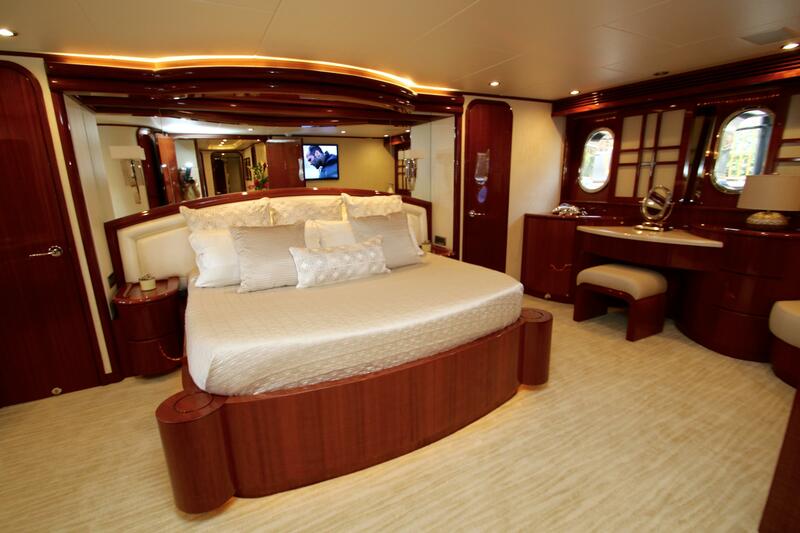 The VIP cabin is forward and on the port side with a walk around double bed and en-suite facilities. 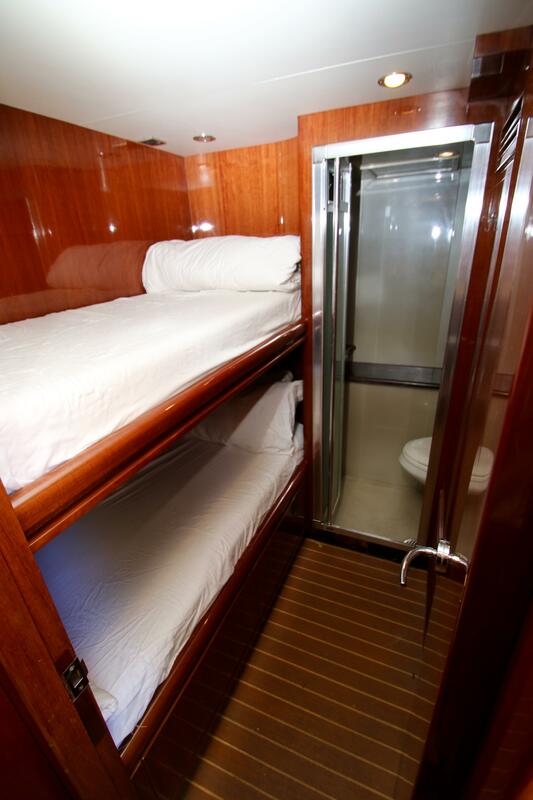 Two twin cabins are on port and starboard with an additional Pullman berth each and en-suite facilities.